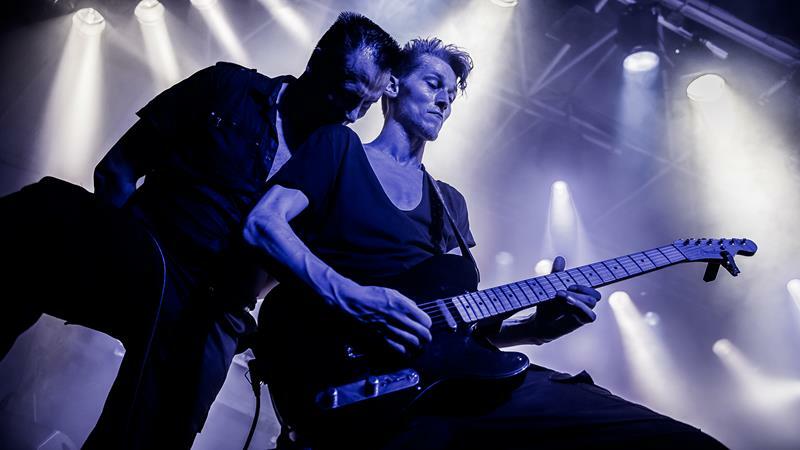 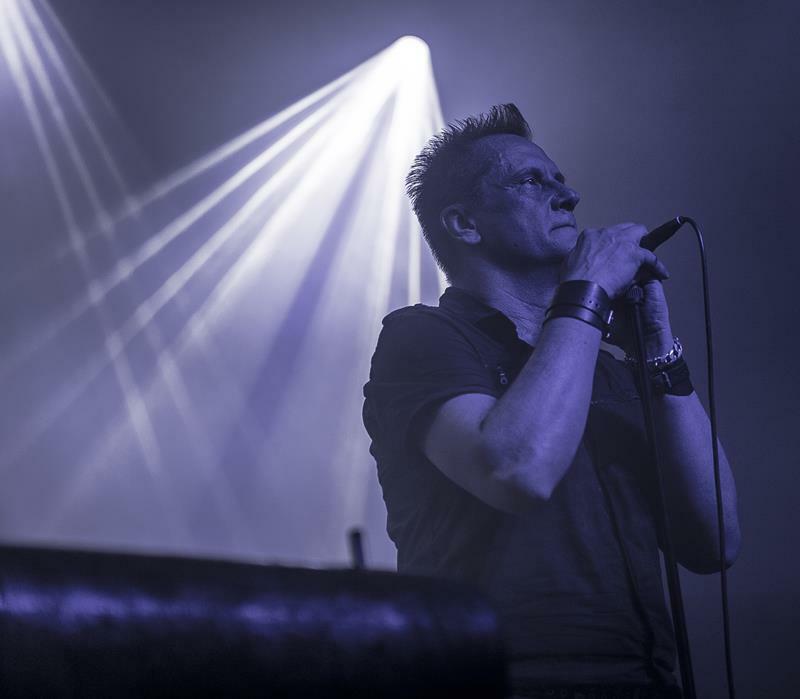 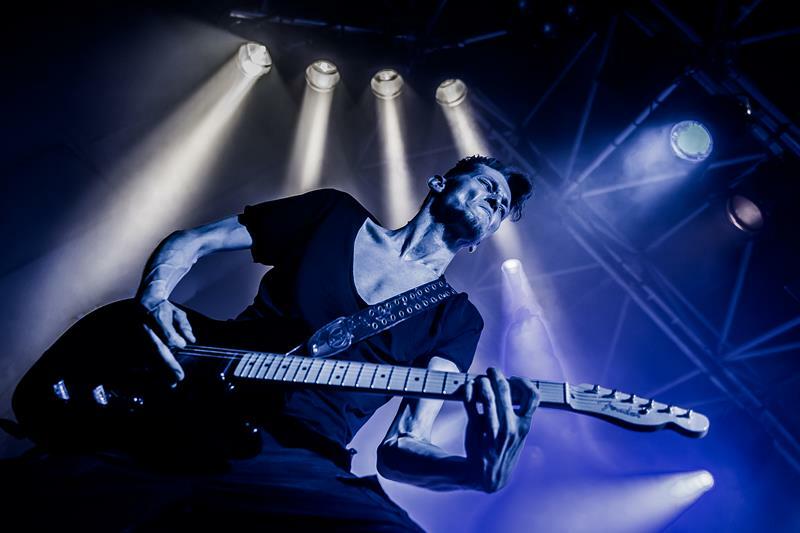 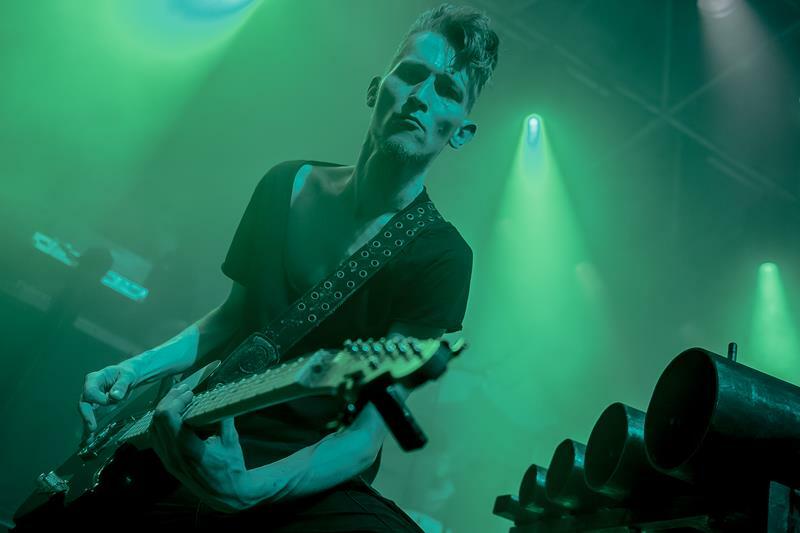 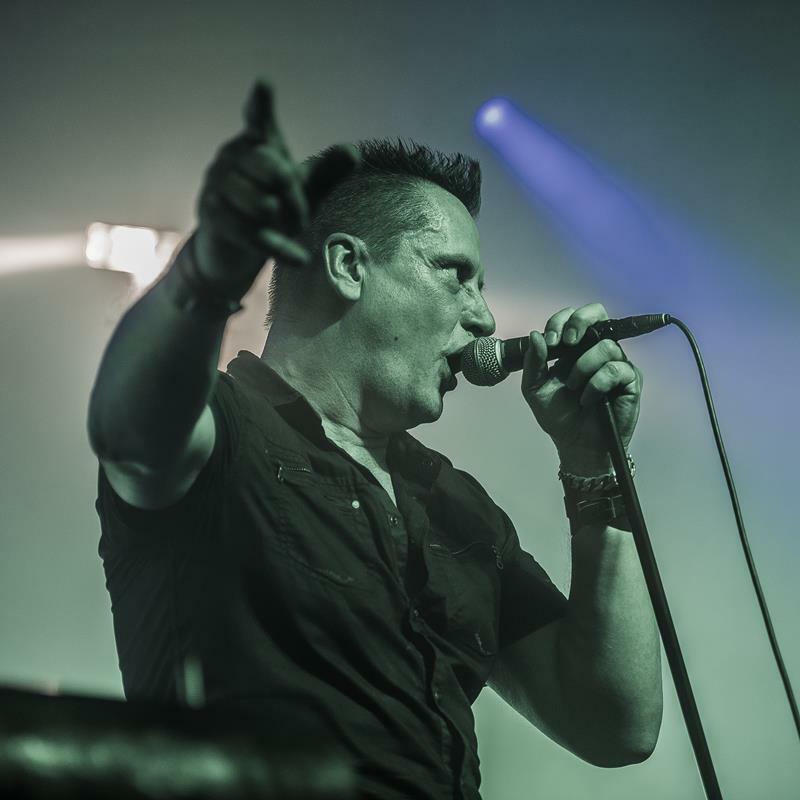 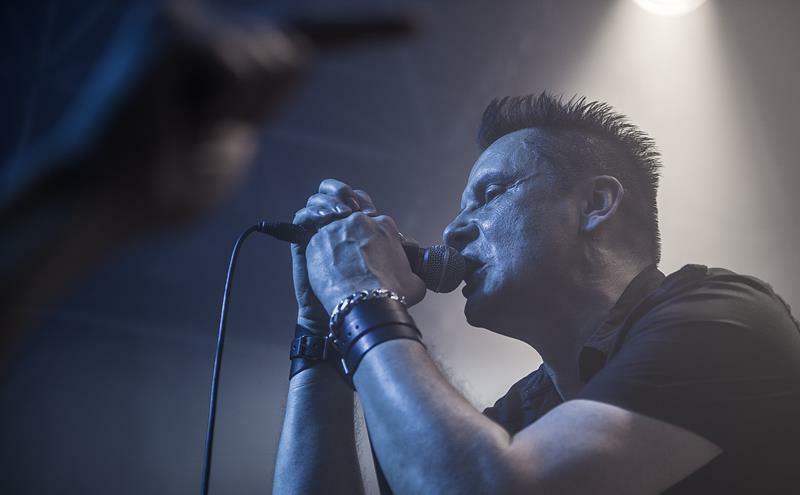 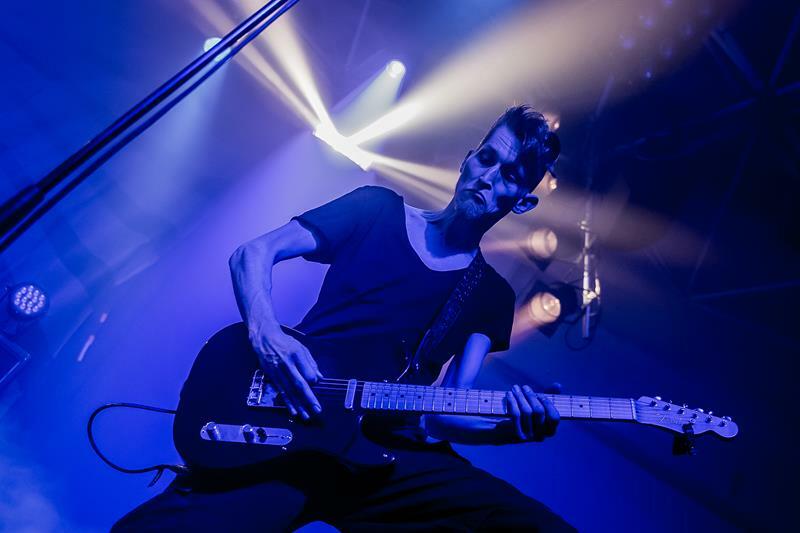 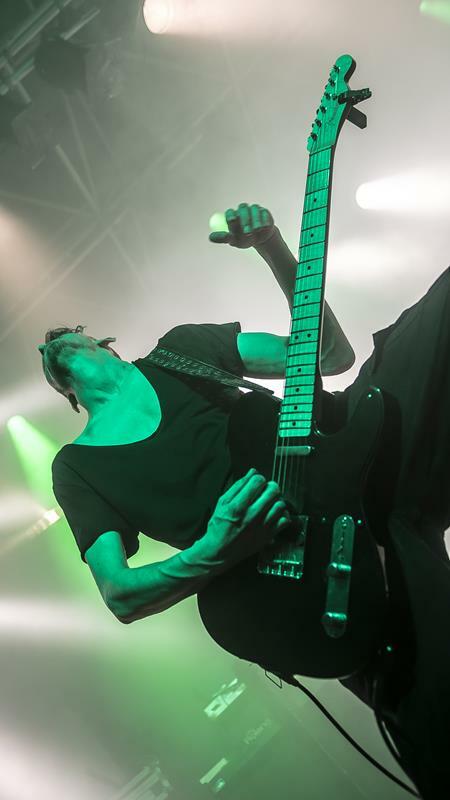 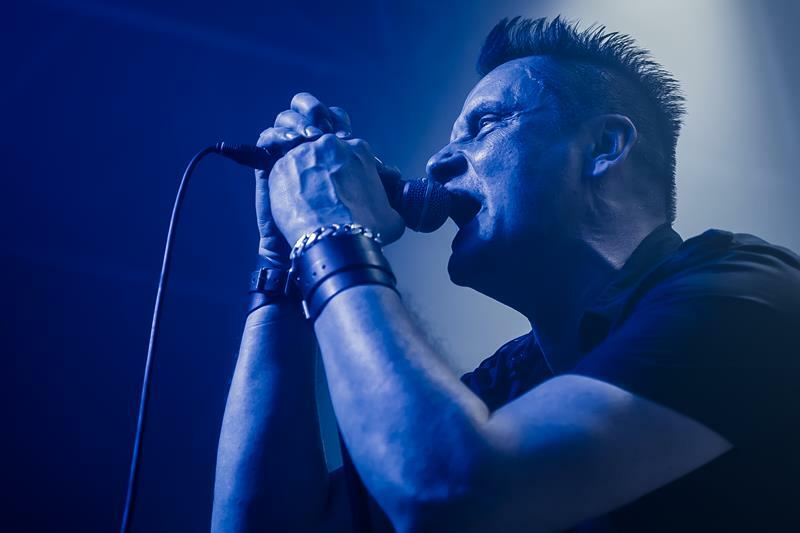 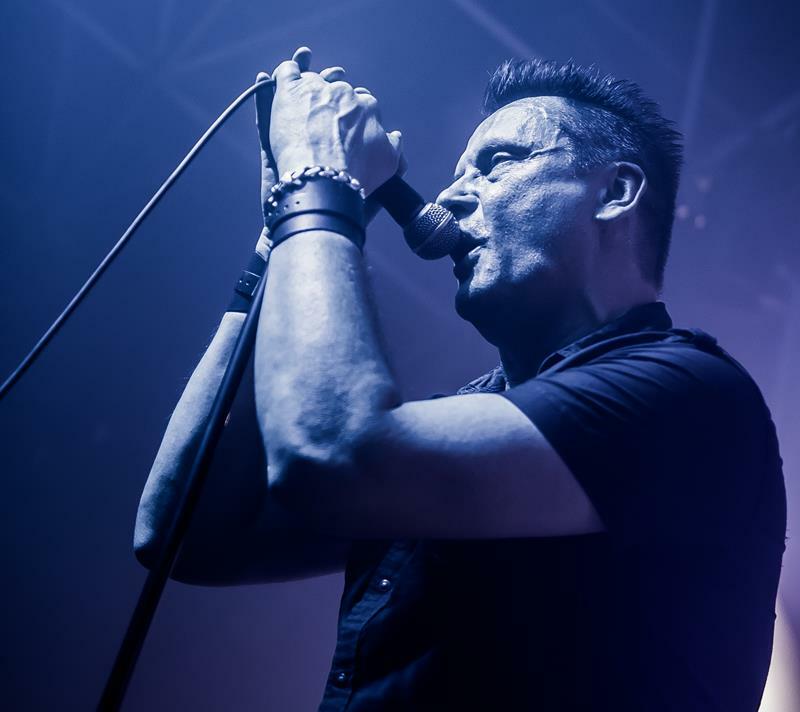 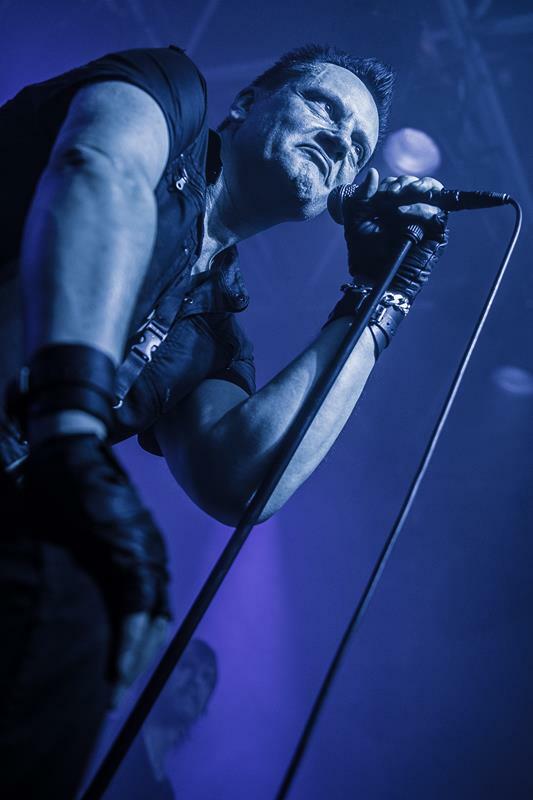 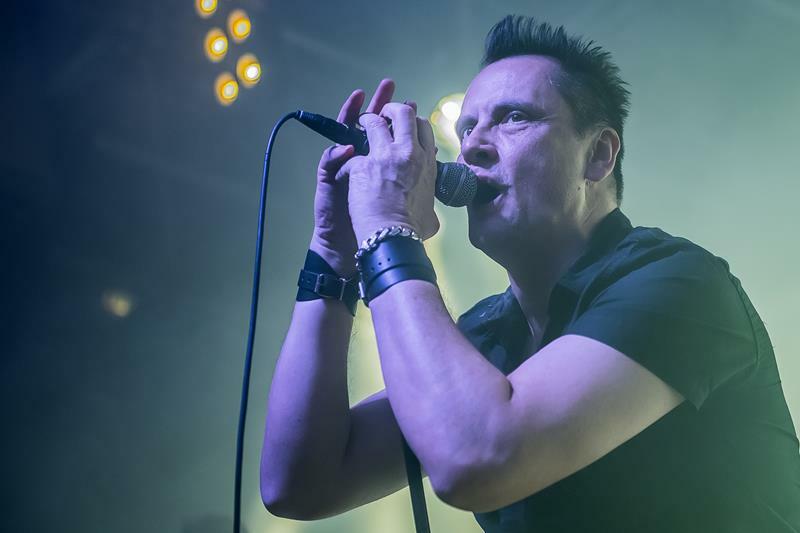 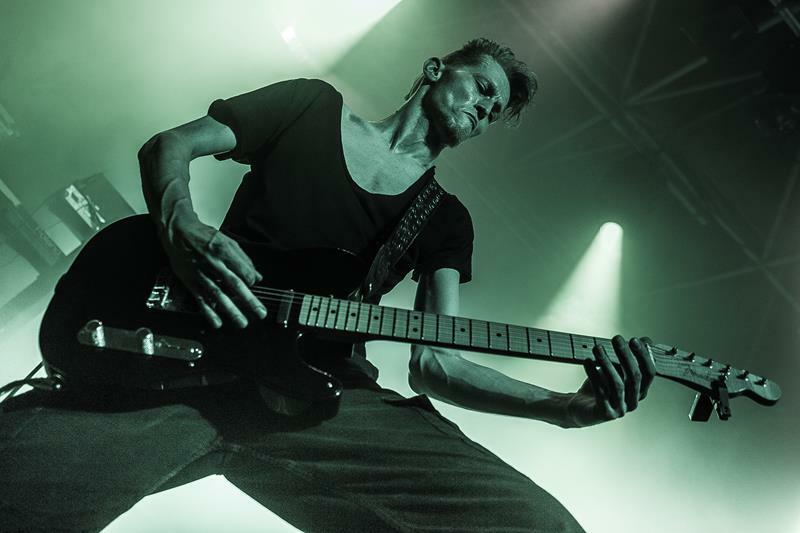 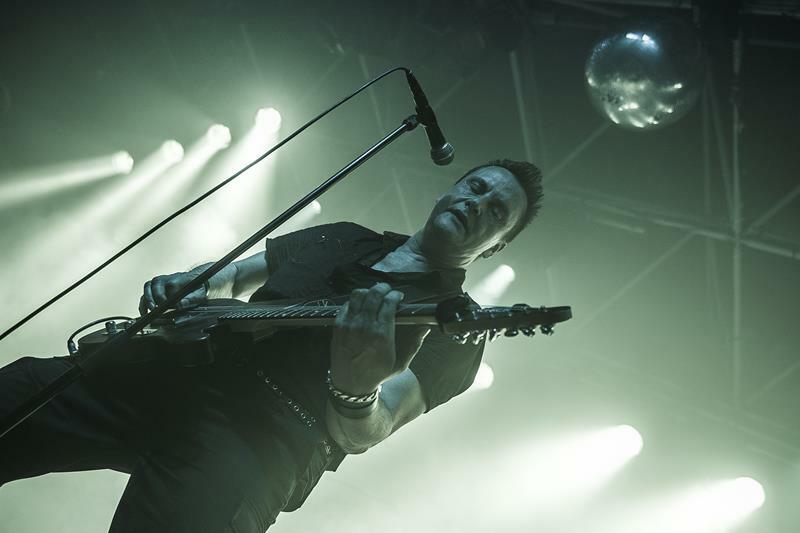 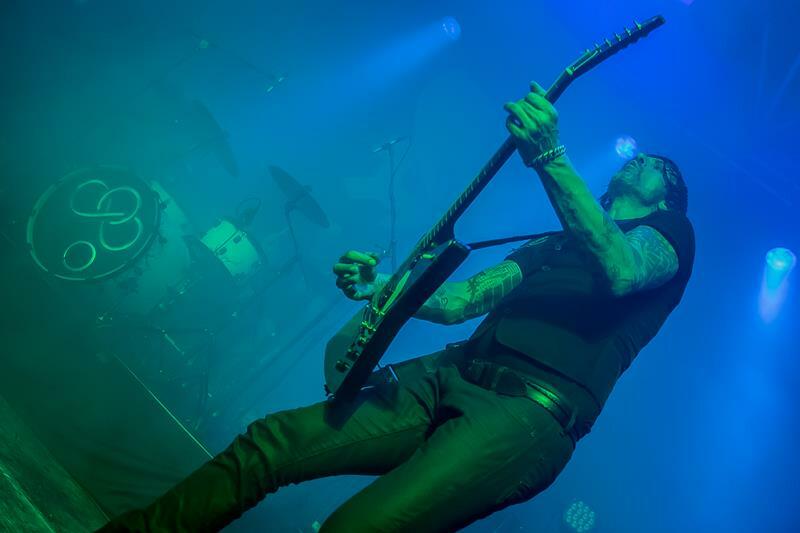 Talk about home game: Industrial pioneers DIE KRUPPS returned to their home town Düsseldorf to celebrate 38 years of band history in the lovely zakk venue. 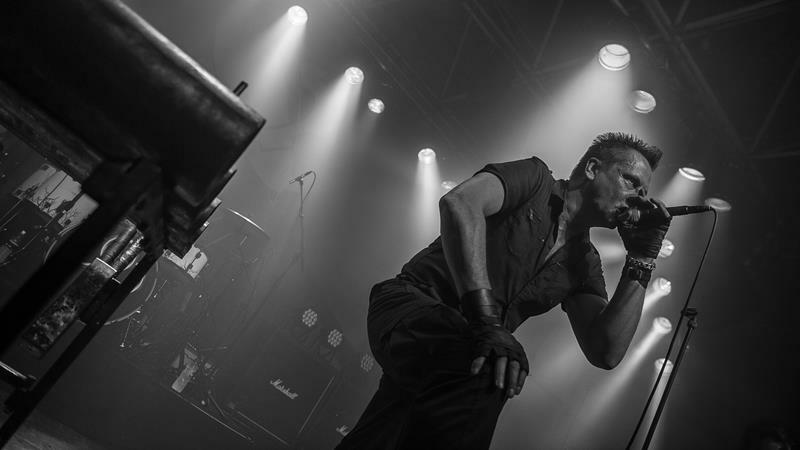 They were bringing reinforcements in the form of two bands BARABAZ and JOHNNY DEATHSHADOW to make this a special evening. 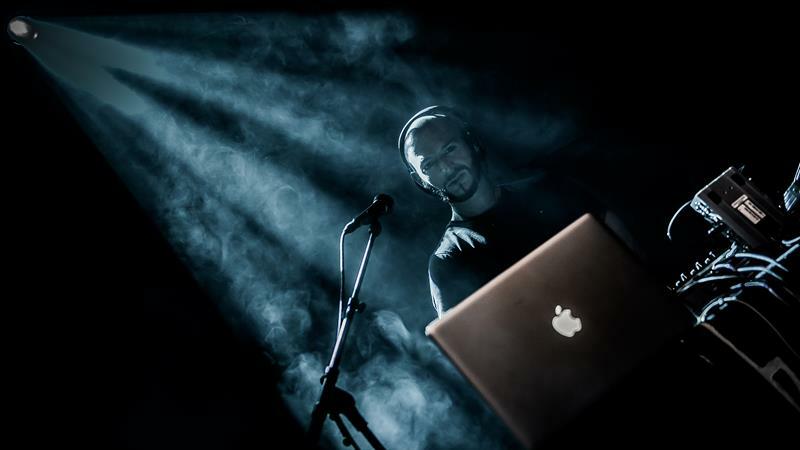 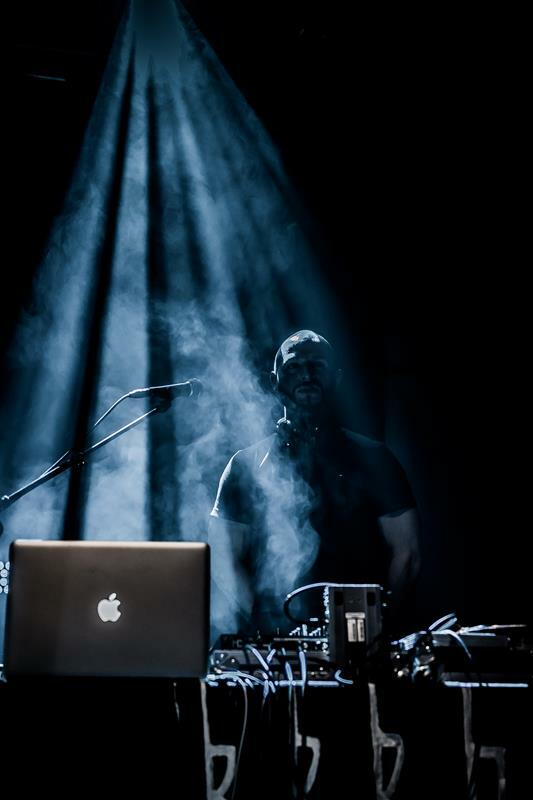 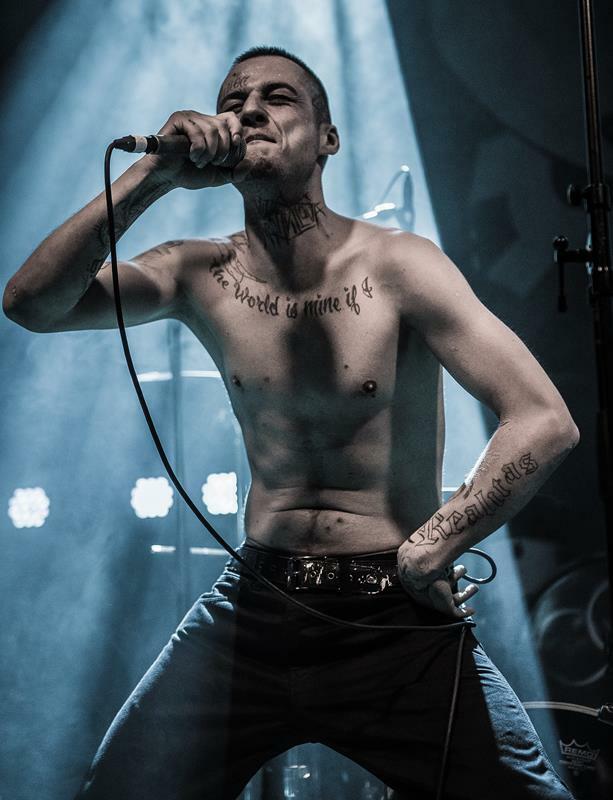 At 8:15pm, vocalist Ainars and the tour DJ Florian Etzel aka DJ Ataxy went on stage and started to perform their ultra-dark version of rap. 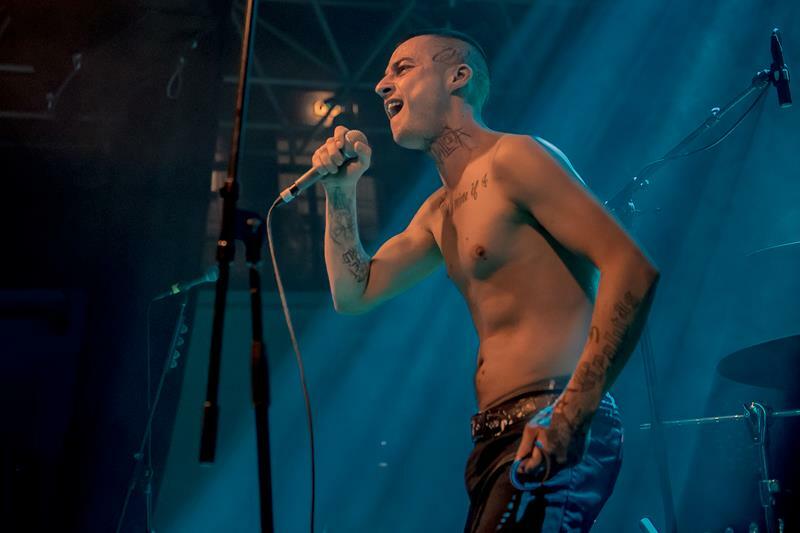 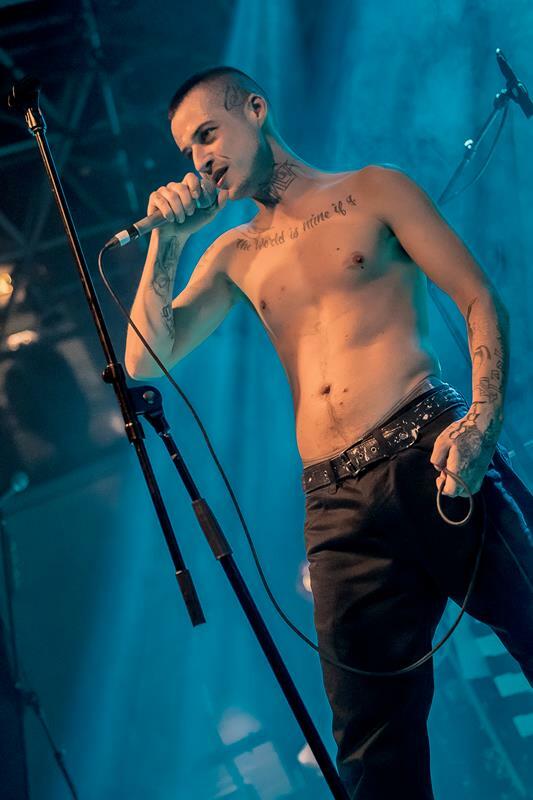 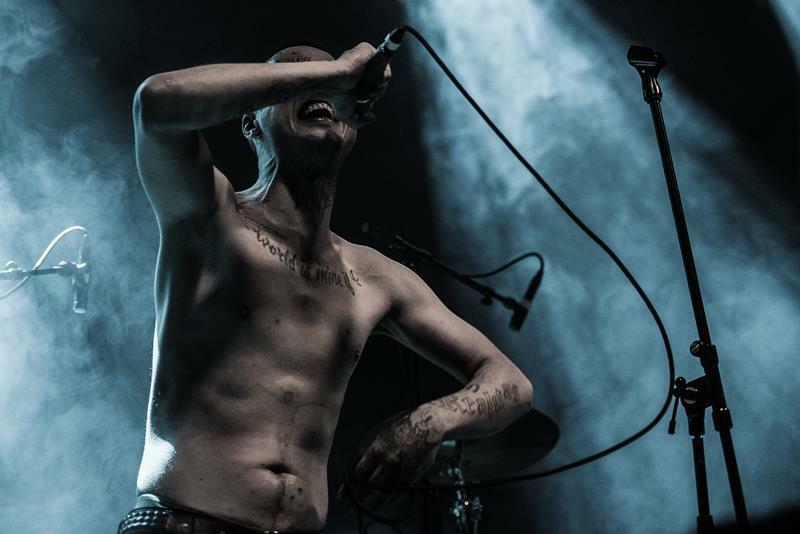 Ainars spit out the German lyrics with a cutting intensity, accompanied by deep trap beats and 808 synth sounds, and he most definitively could audition for the role of CASPER’s convict brother. 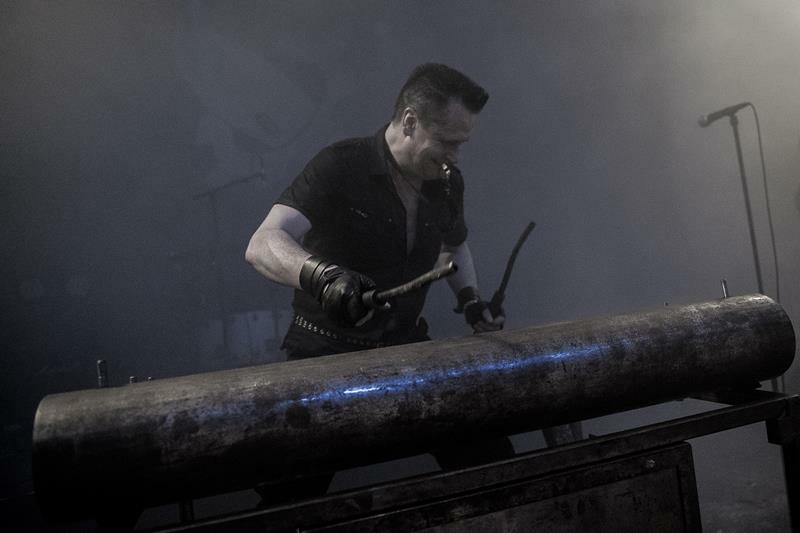 Music-wise, the arsenal was more limited, mainly relying on beats and the occasional scratching, making BARABAZ somewhat inaccessible to the crowd of metal heads, who came to see DIE KRUPPS. 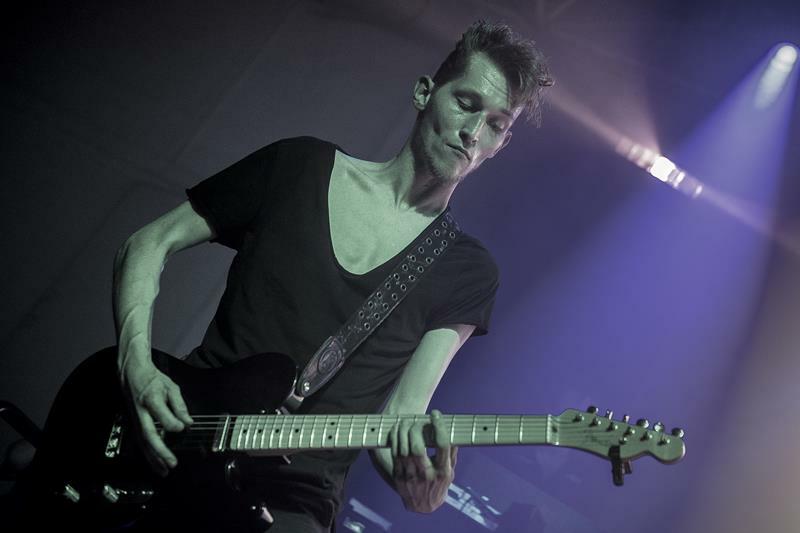 However, most people were polite and open-minded enough to give applause during and after the 30-minute set. 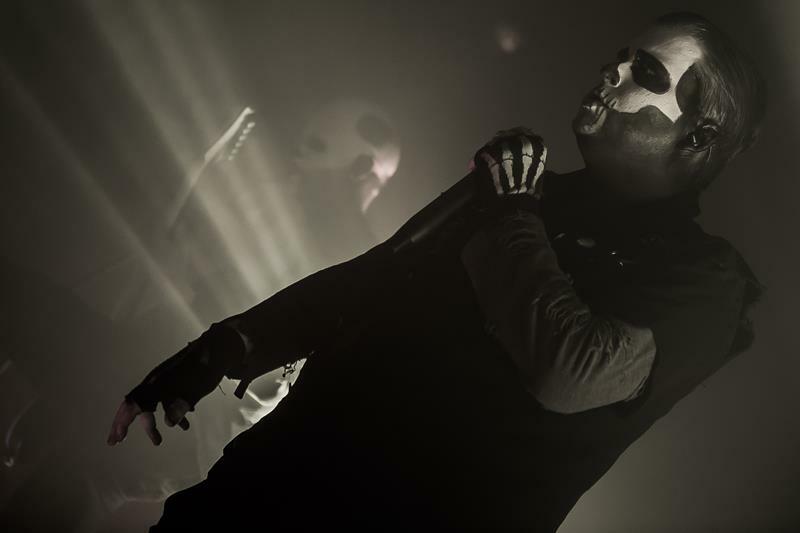 After an incredibly short stage break of 8 minutes, the four band members with the characteristic skull make-up entered the stage. 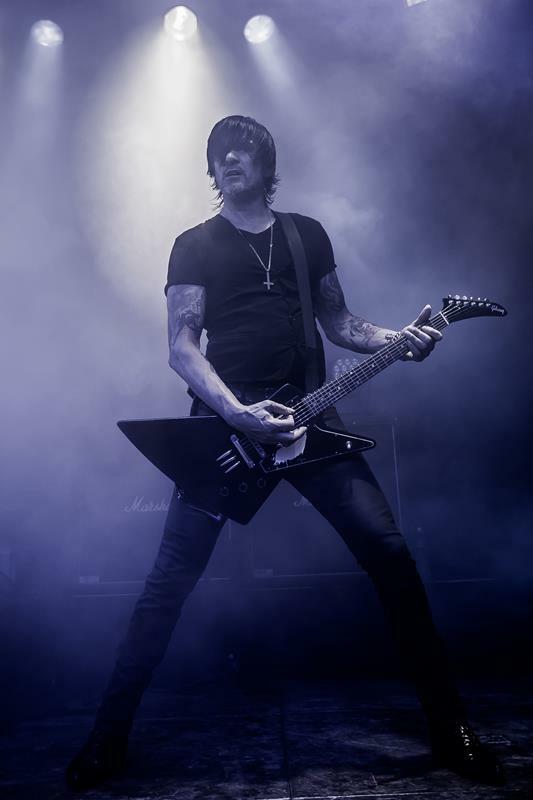 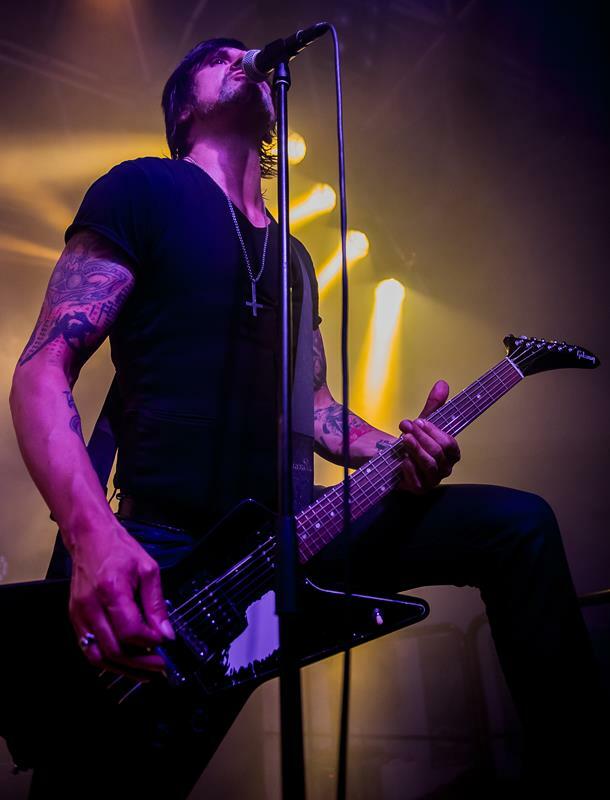 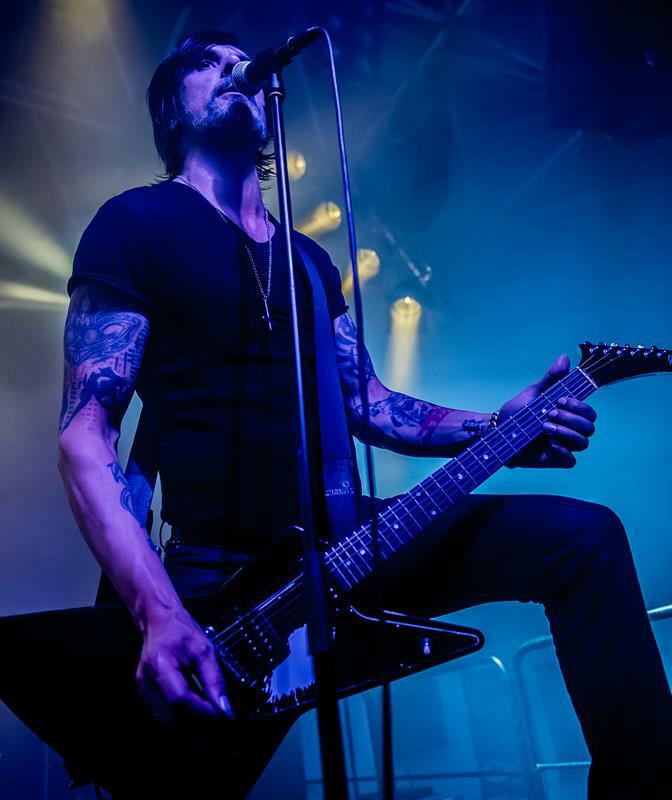 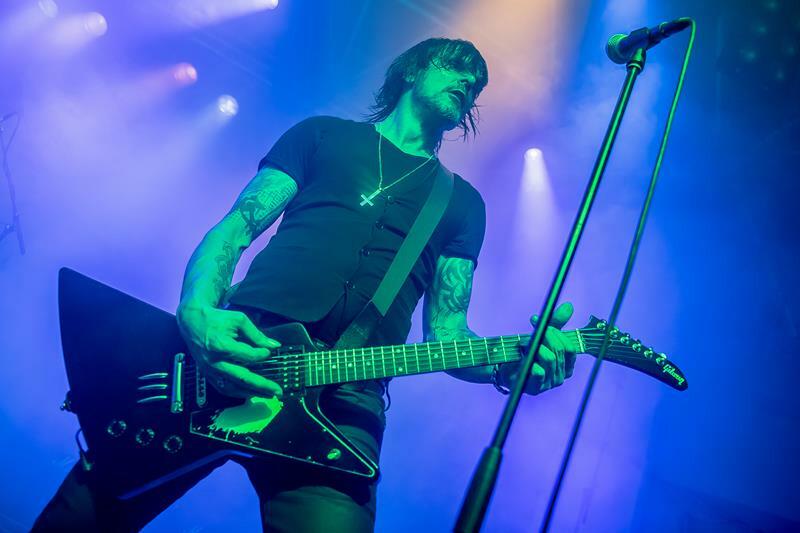 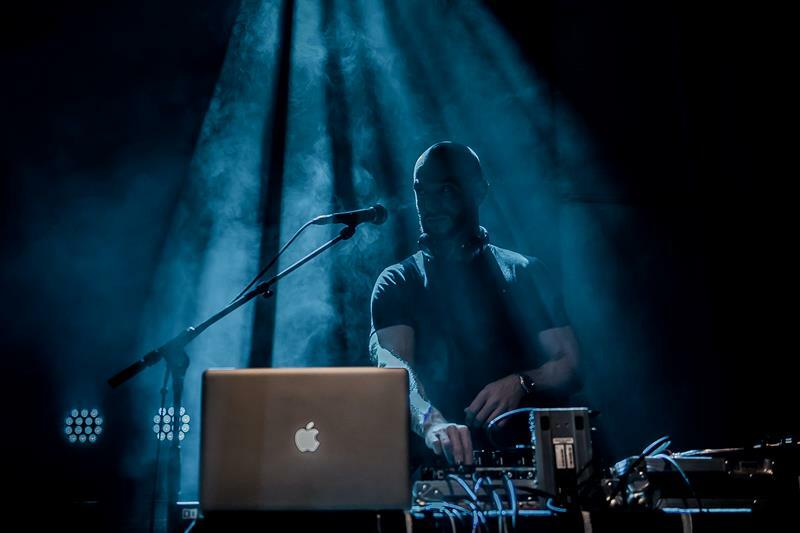 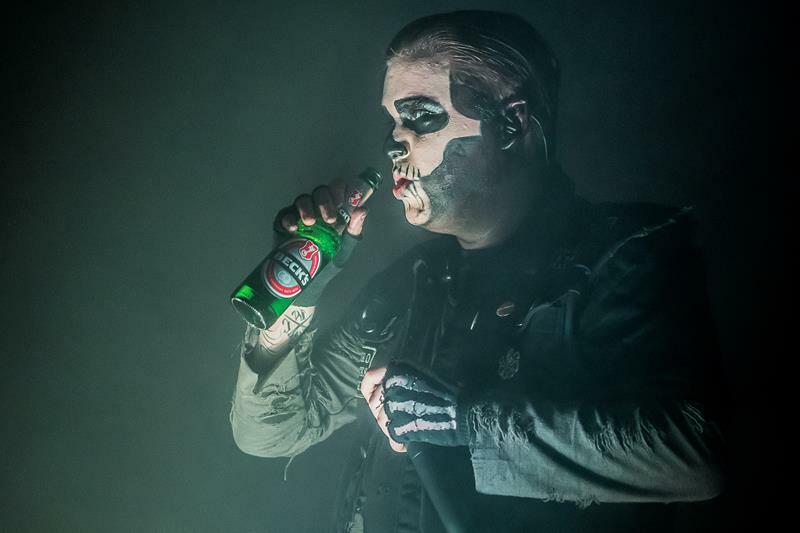 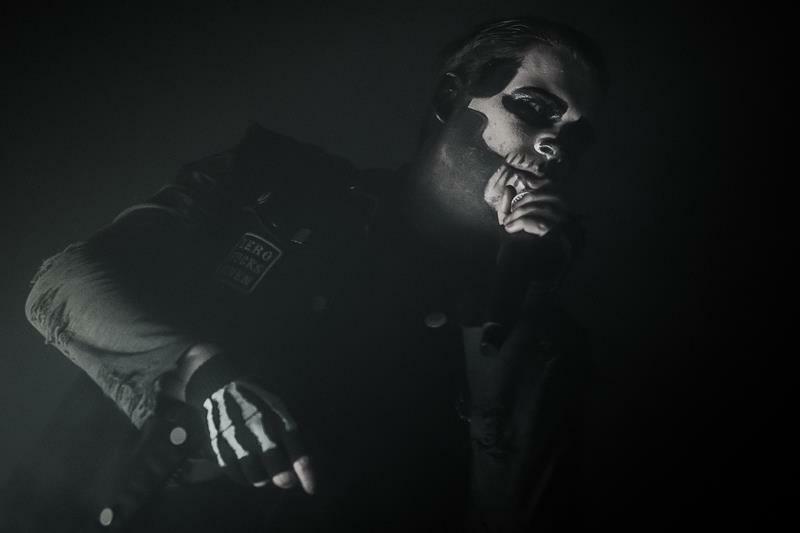 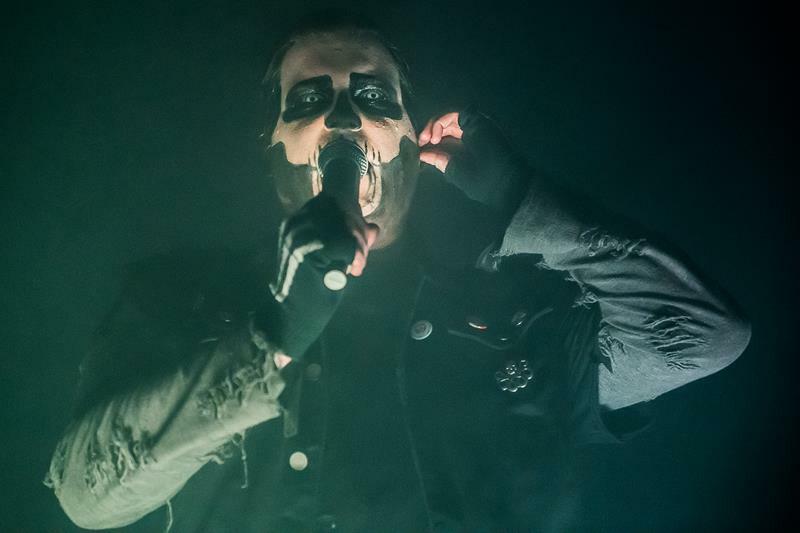 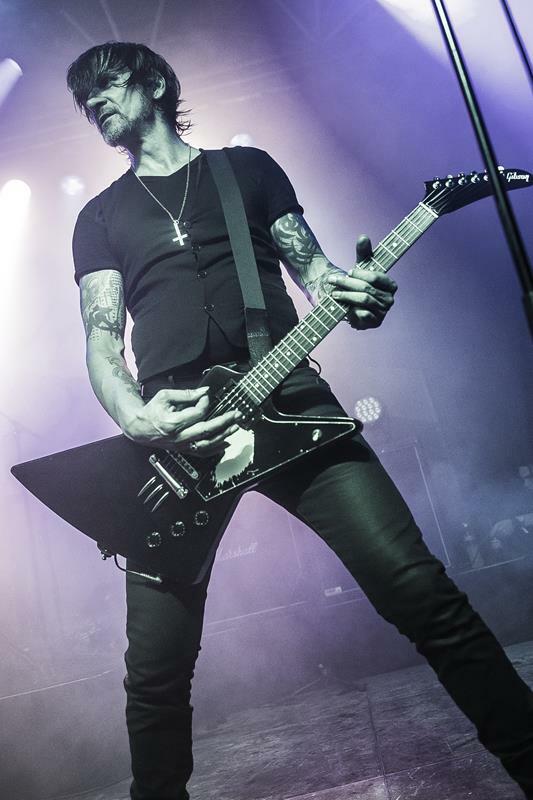 From the beginning it became clear that this would be a totally different show, as the opener featured Gothic Metal riffing at its finest, which was complemented by electronic synth sounds, which gave their music a certain industrial feel. 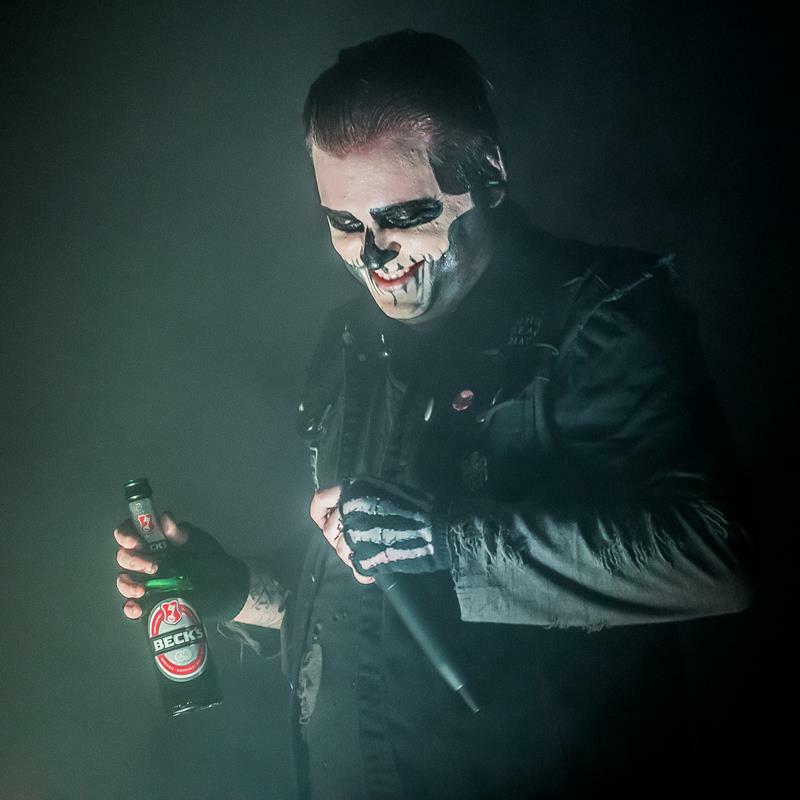 Singer and founding member Jonathan Schneider seemingly enjoyed his first visit to Düsseldorf, and jokingly reprimanded the audience that the city would have to work on its beer, while toasting with a bottle of Beck’s. 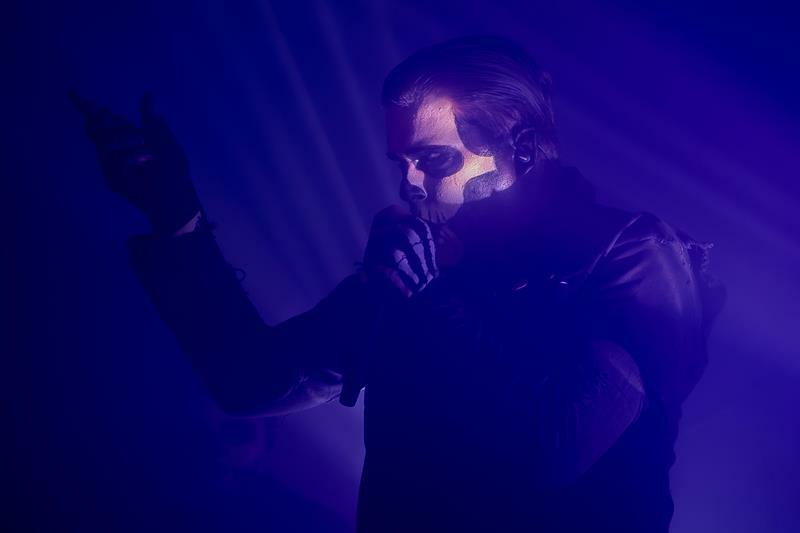 In terms of entertainment, JOHNNY DEATHSHADOW did an excellent job, as both their music and also the lighting (with tons of fog) did not fail to impress. 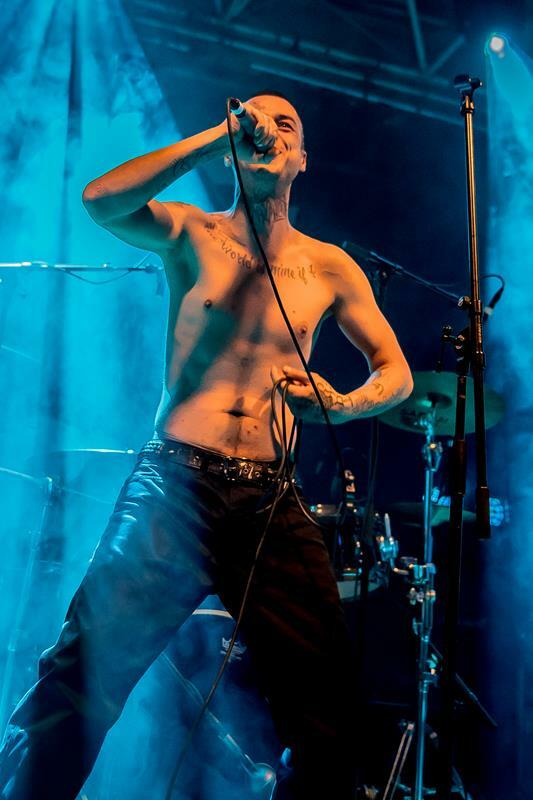 However, Jonathan’s call for a circle pit went unheeded, which was probably due to the fact that the average age of the audience members was a little higher than usual. 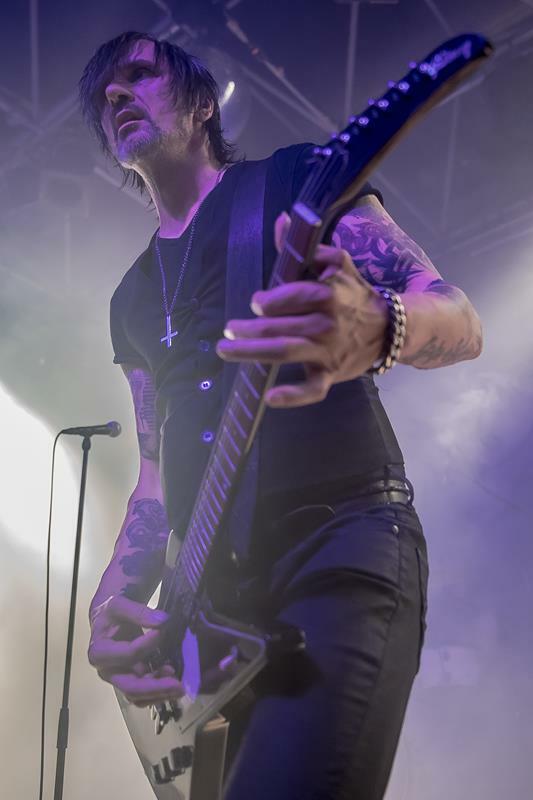 Nevertheless, JOHNNY DEATHSHADOW played a little longer than the obligatory thirty minutes and received warm applause from the audience. 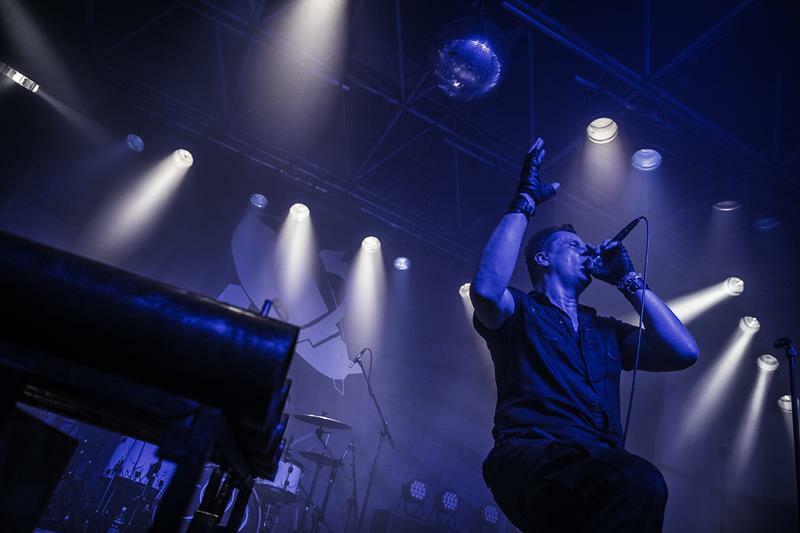 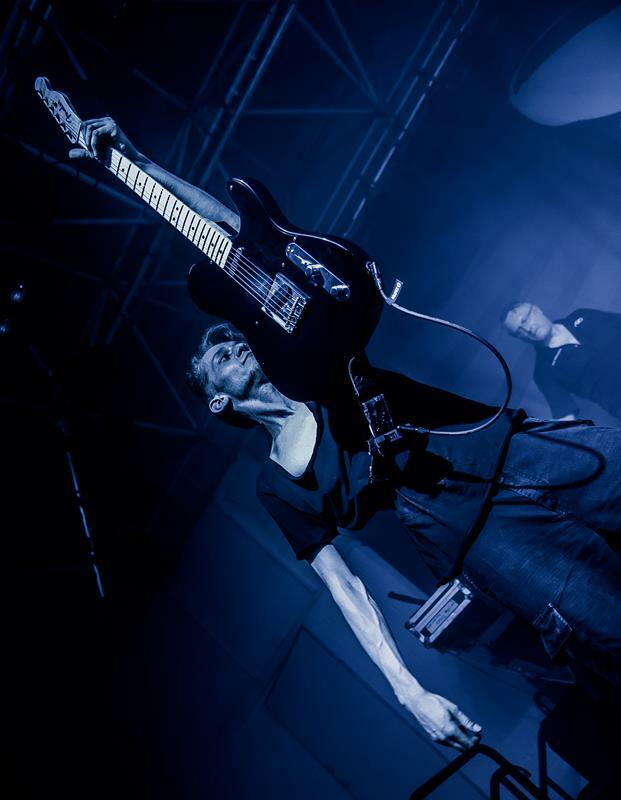 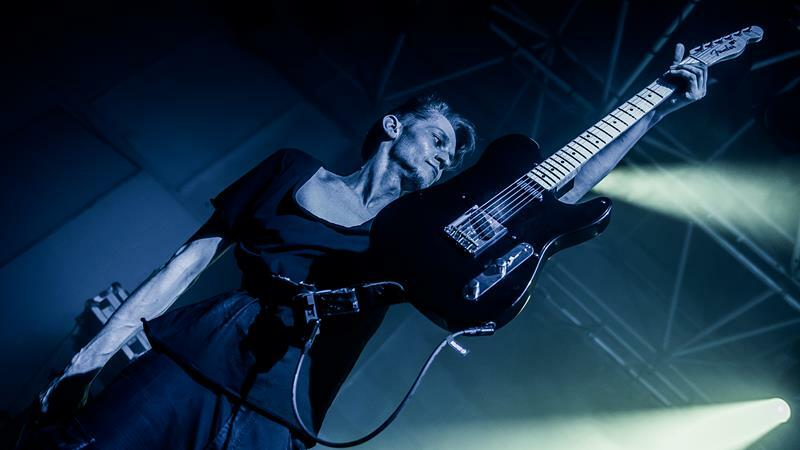 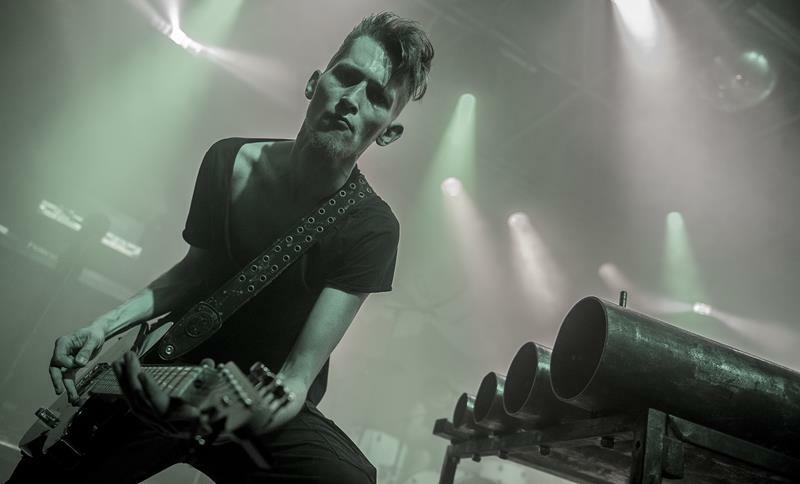 In the introduction I already mentioned the substantial contribution DIE KRUPPS have made to the development of Industrial over the duration of almost four decades. 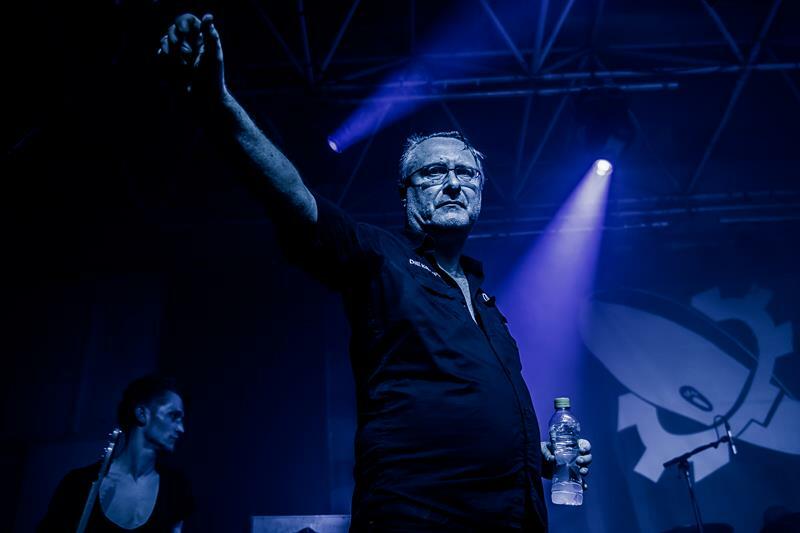 Although the band around mastermind Jürgen Engler (not Hartmut!) 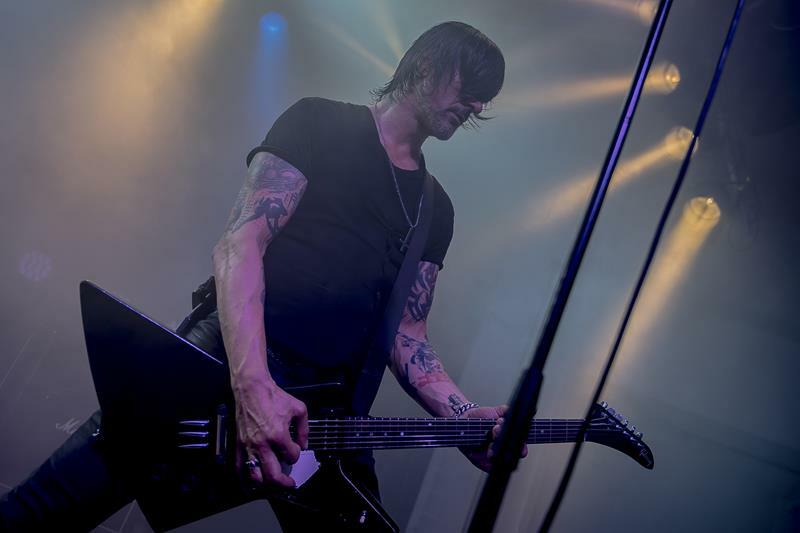 went on an eight-year hiatus between 1997 and 2005, it never really dissolved. 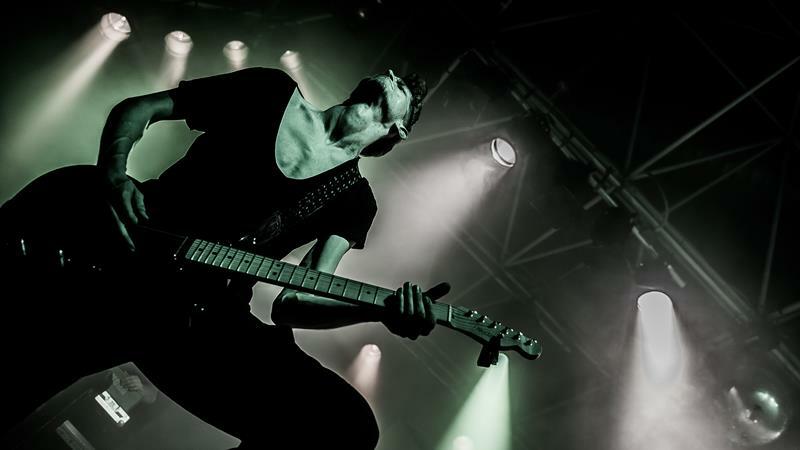 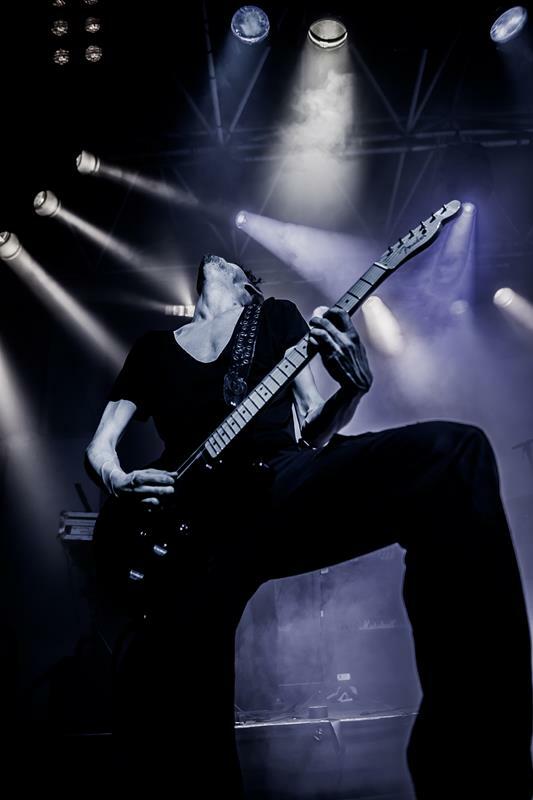 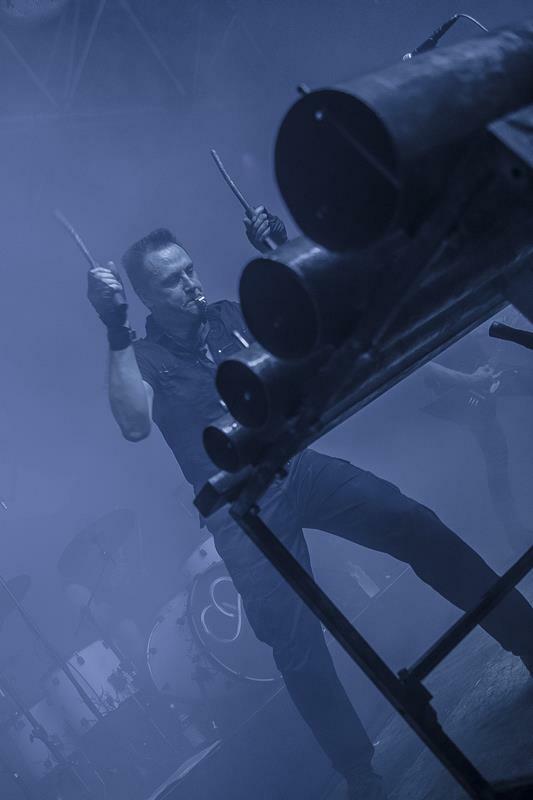 To find out more about the band, check out www.diekrupps.com or https://www.facebook.com/diekruppsofficial/. 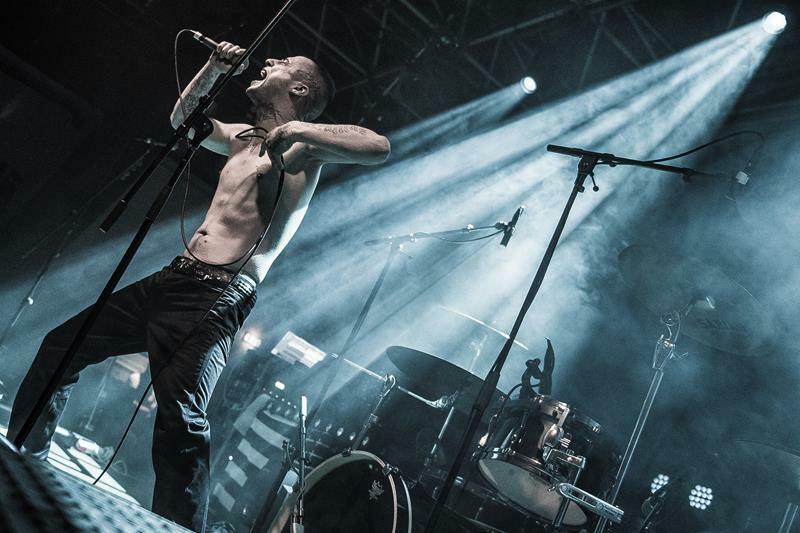 Shortly before 10 pm, the lights went out, and the band entered the stage. 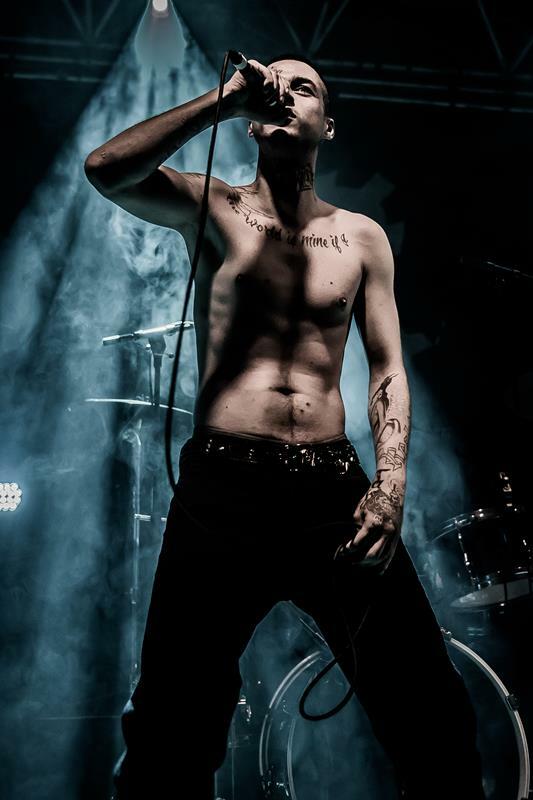 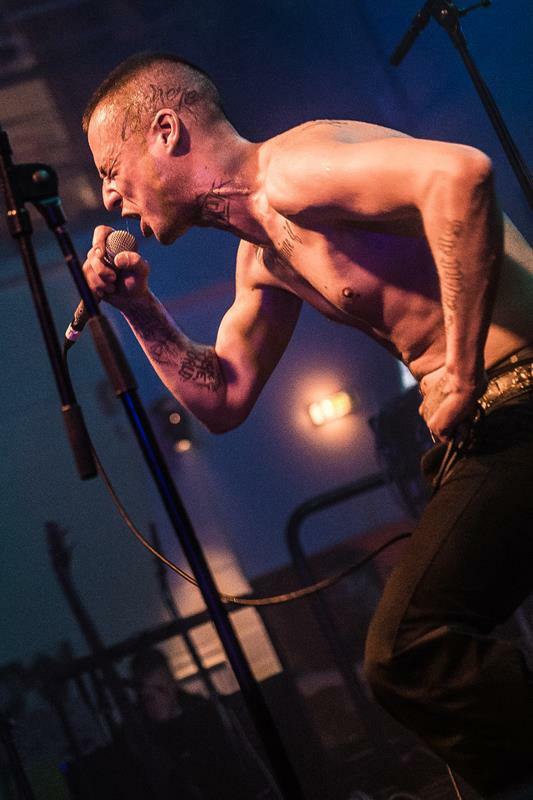 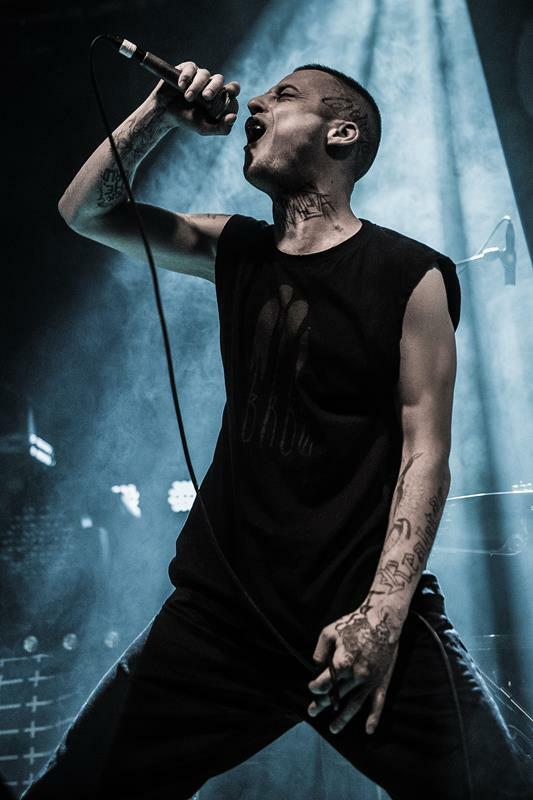 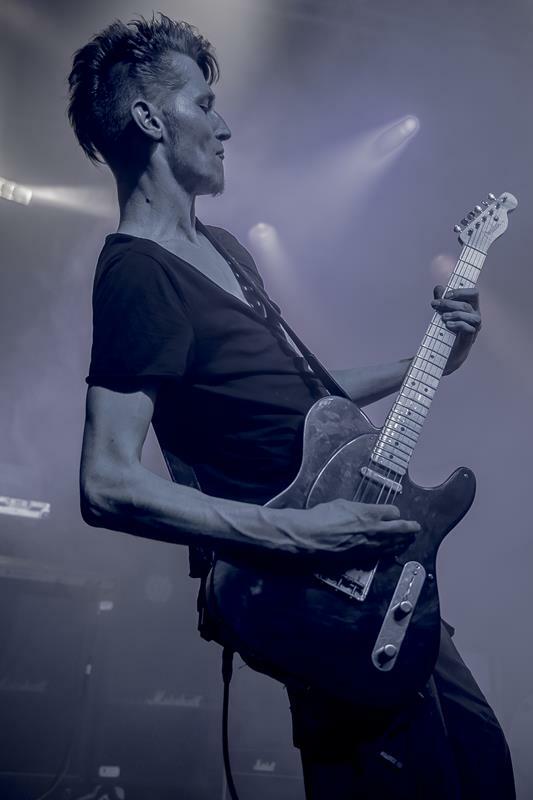 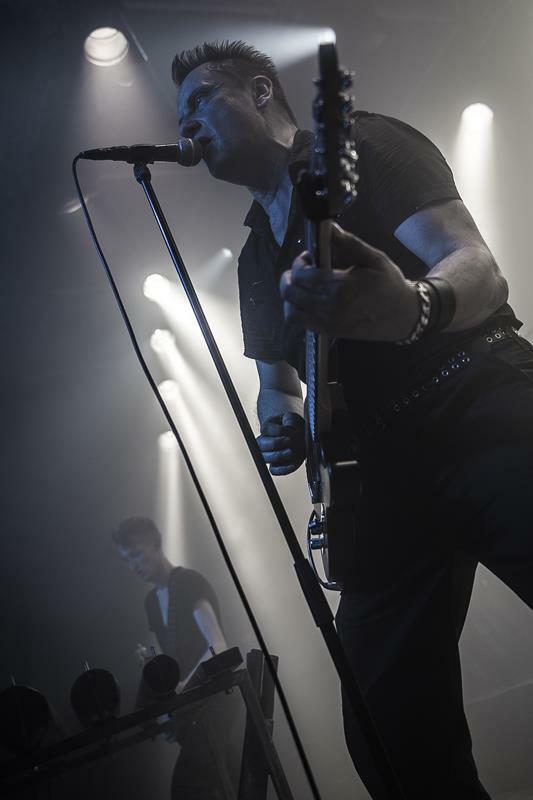 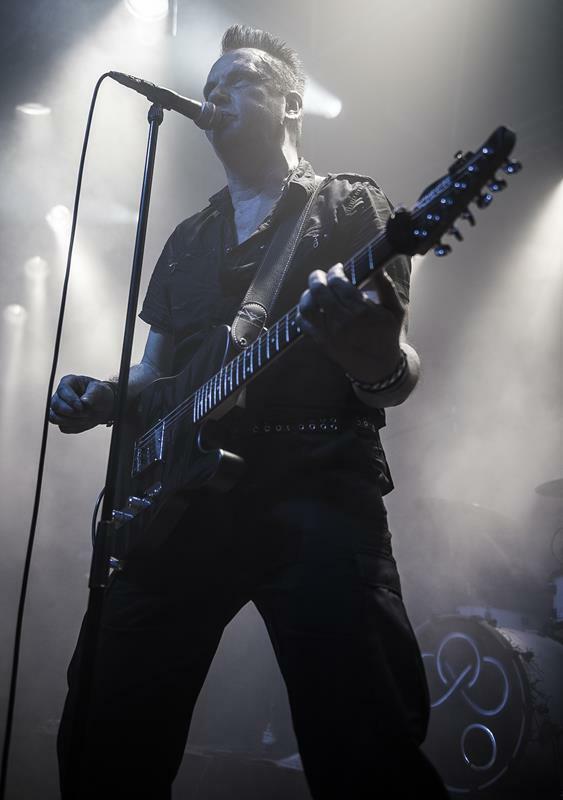 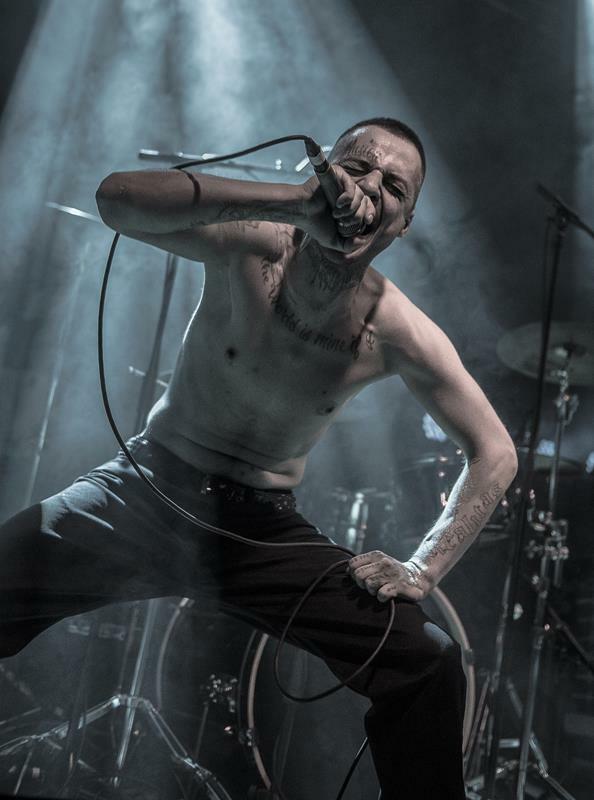 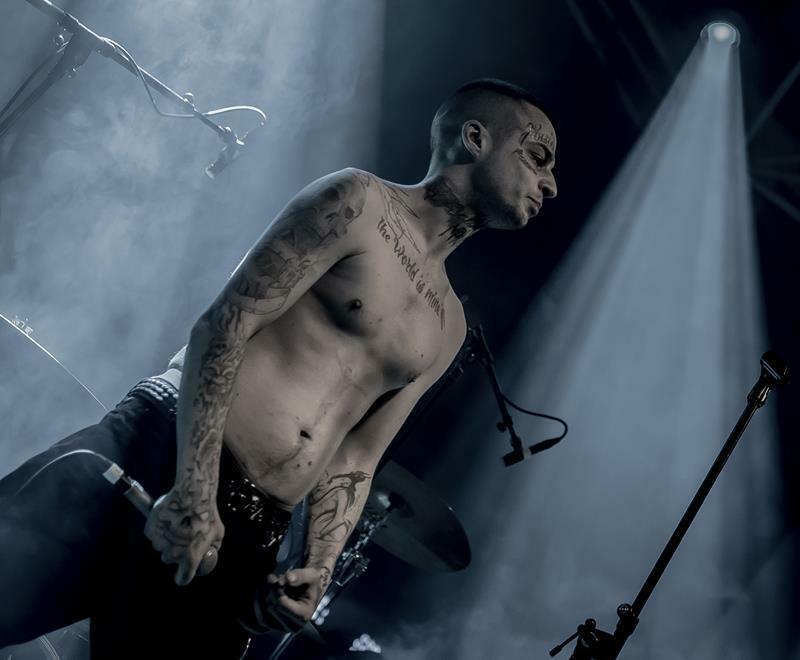 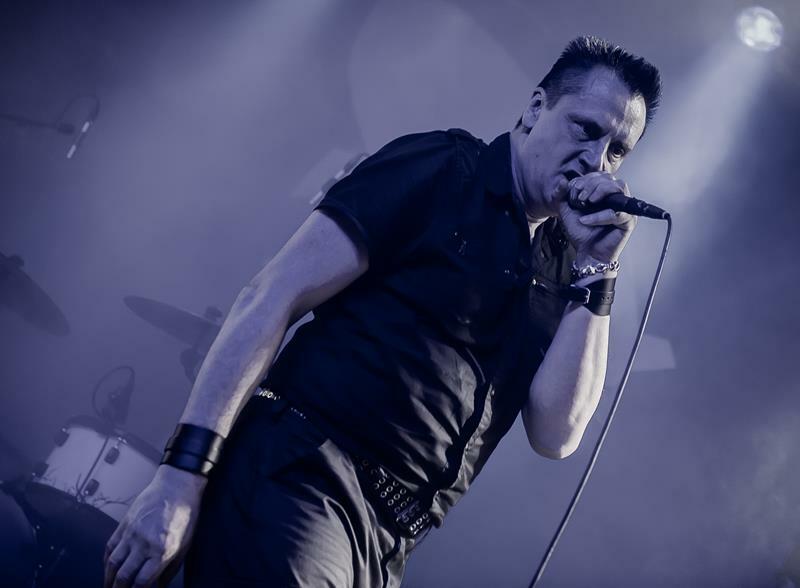 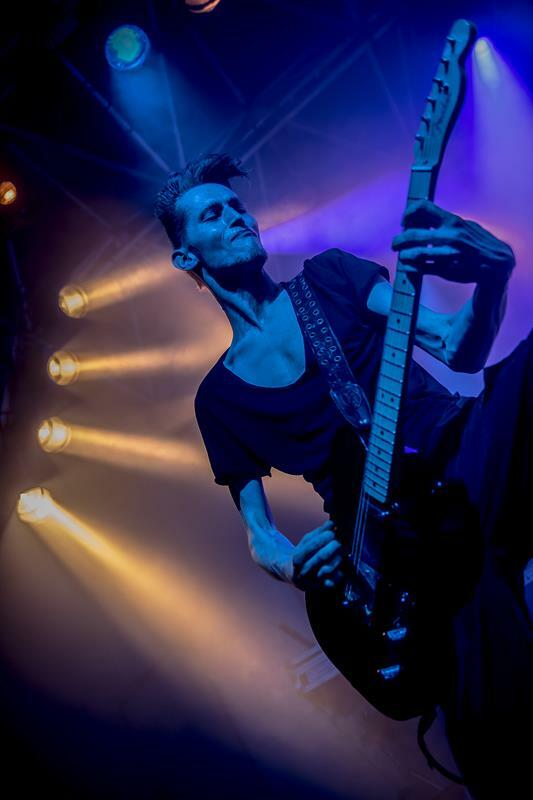 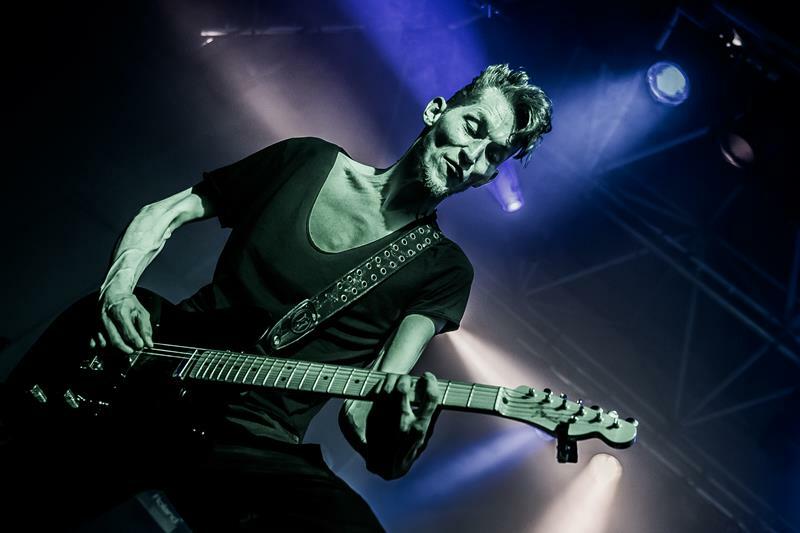 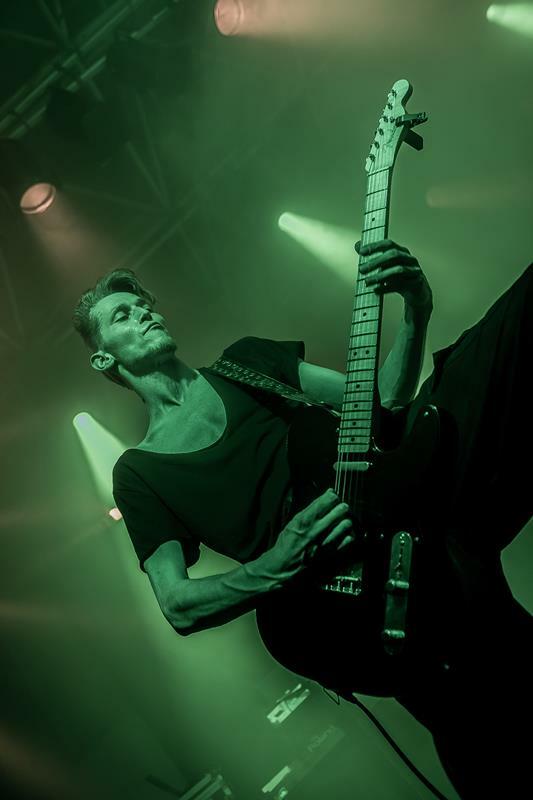 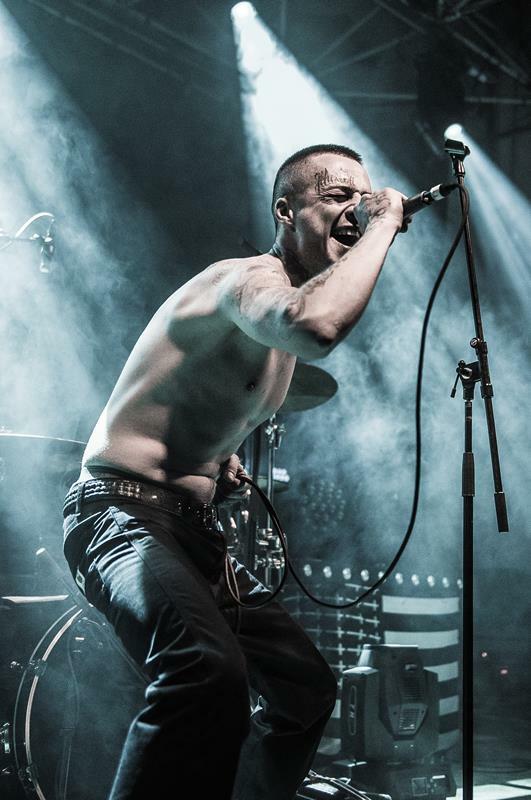 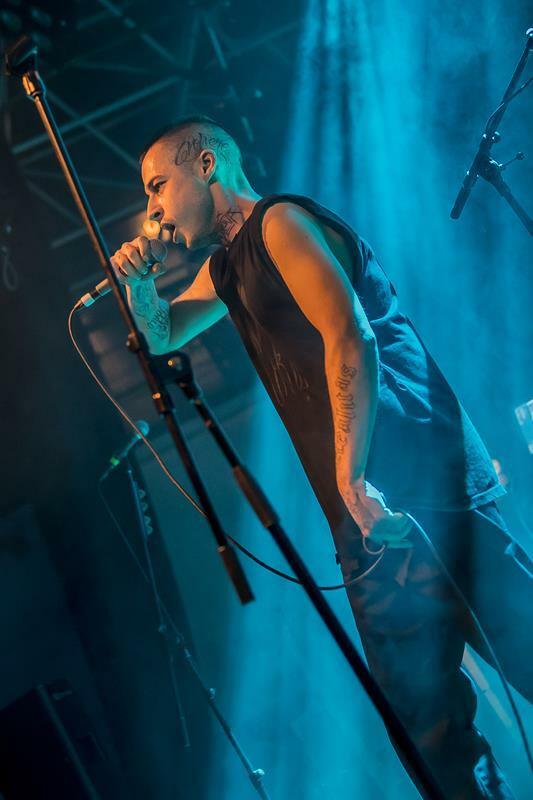 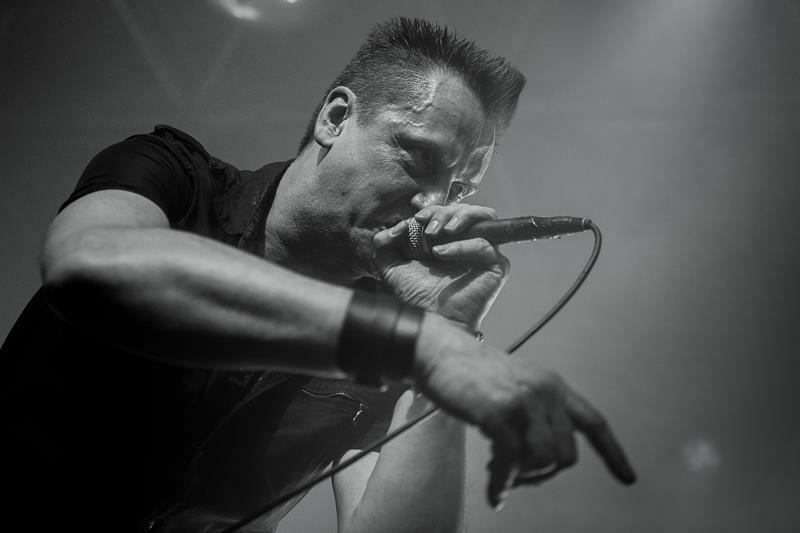 Jürgen Engler - seemingly rejuvenated - was the last to join the stage and the band opened the set with ‘Kaltes Herz’ from the 2015 album ‘V - Metal Machine Music’. 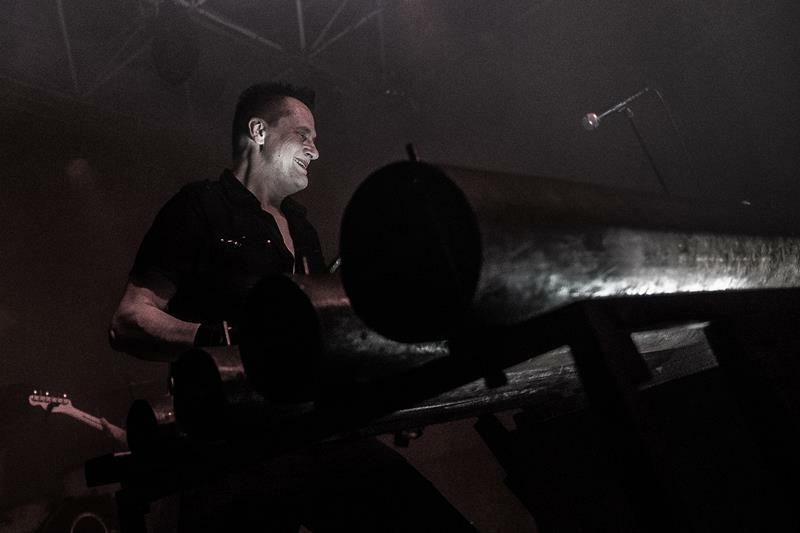 Accompanied by the frenetic cheering of the fans, DIE KRUPPS played classics from 10 different albums of their extensive band catalogue. 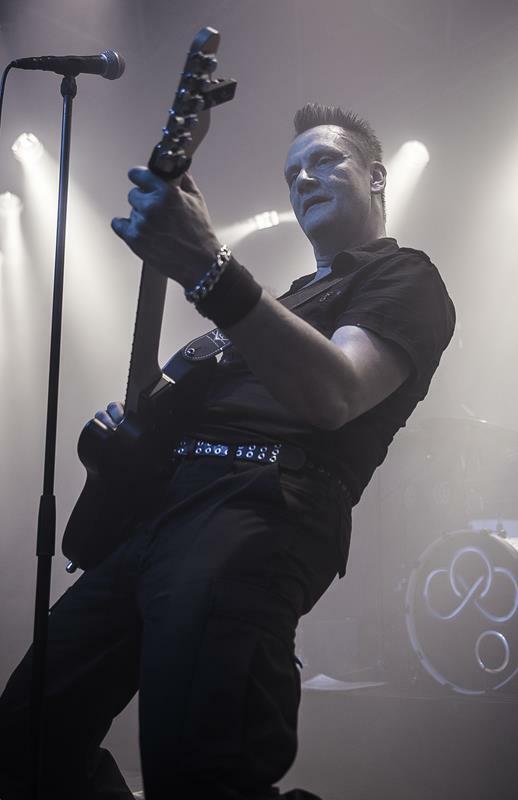 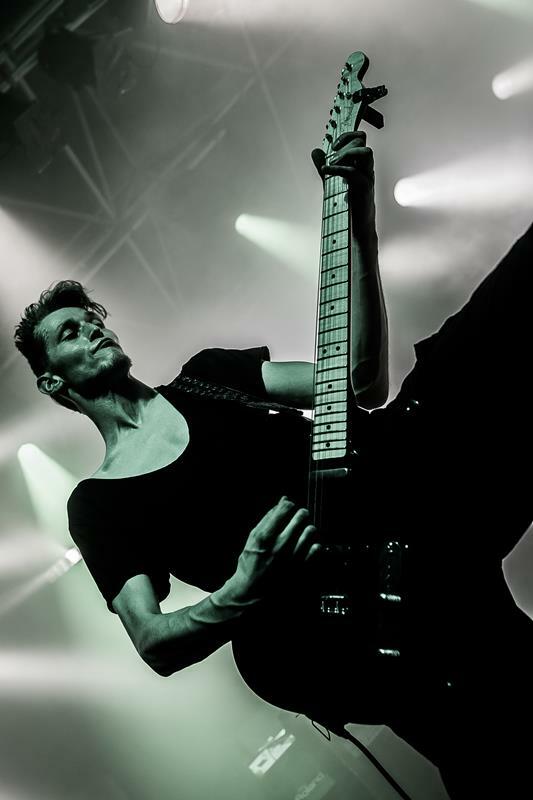 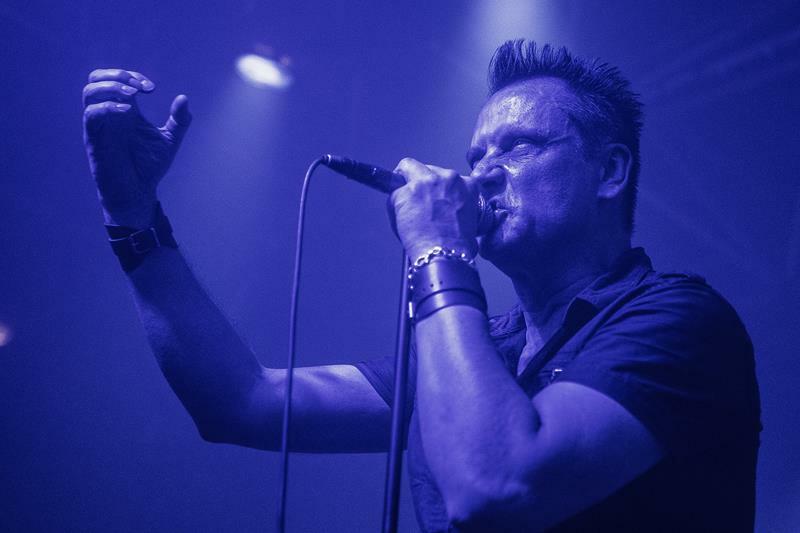 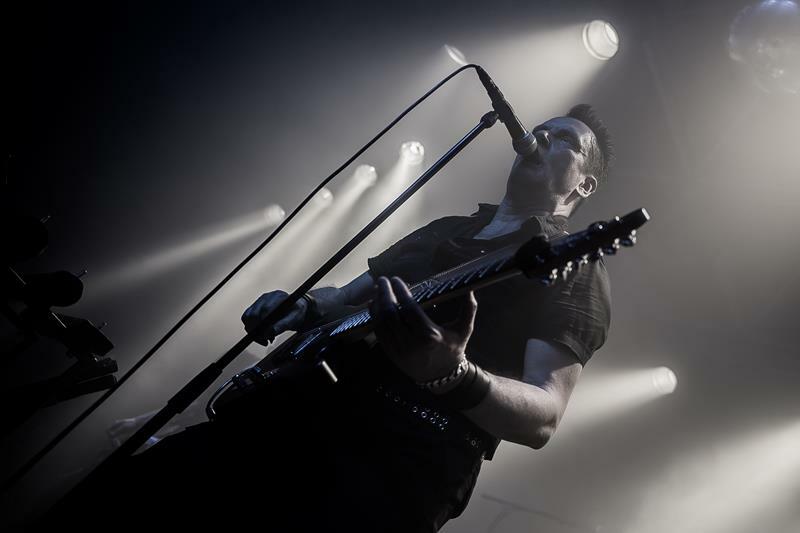 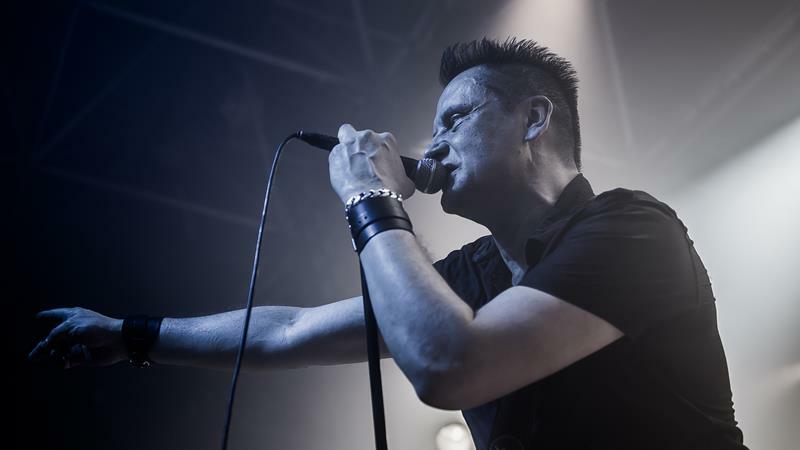 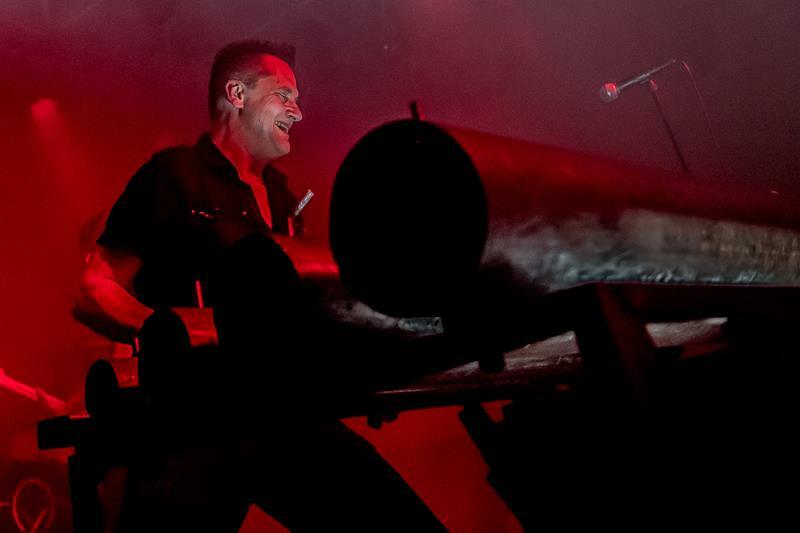 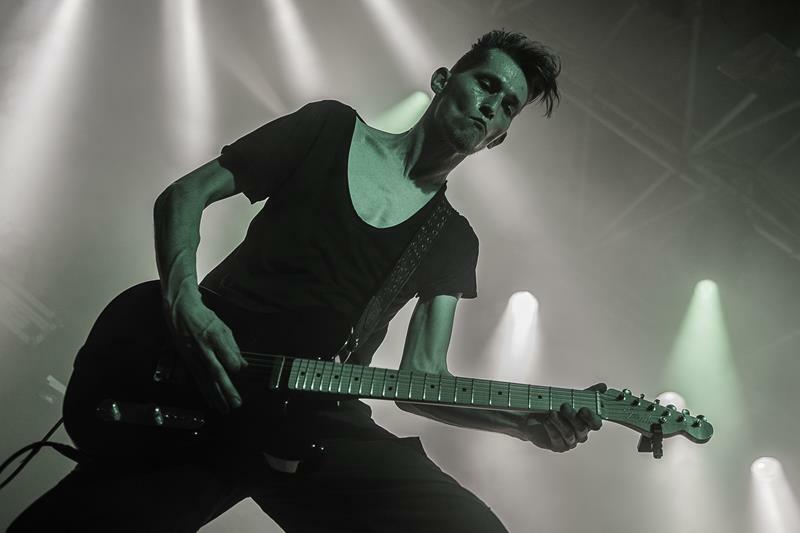 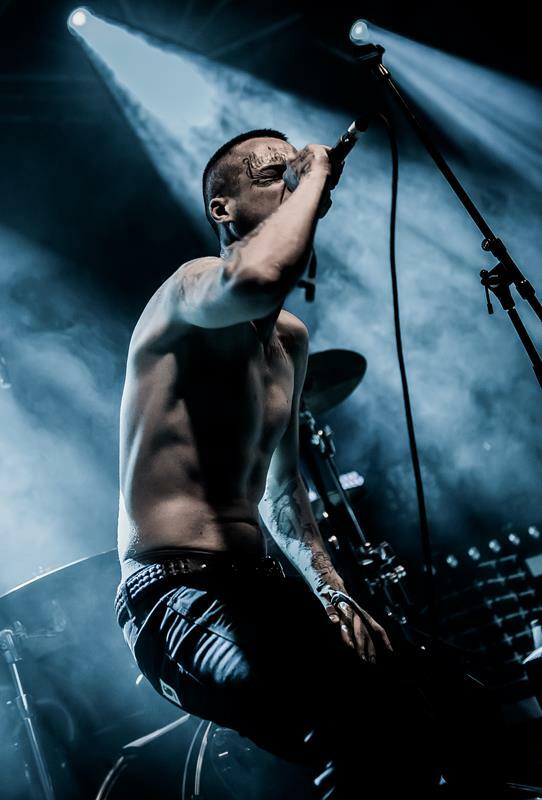 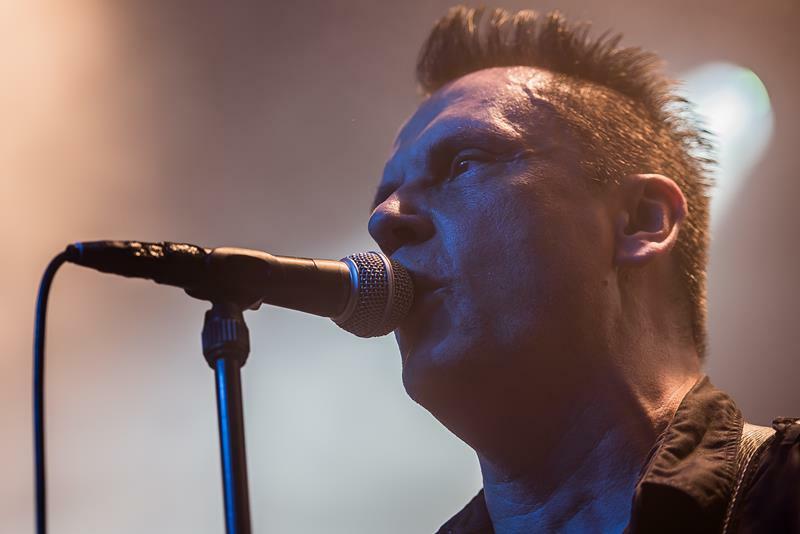 Songs from DIE KRUPPS’s EBM era, such as ‘Der Amboss’, were brought to life with the help of the so-called Stahlophon (“a cross between a xylophone and a railroad track”), which Jürgen hit with seemingly endless energy. 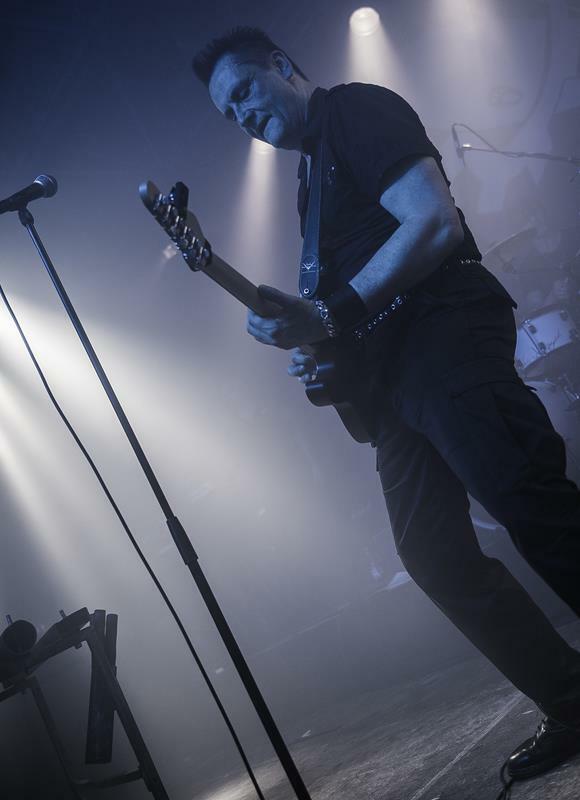 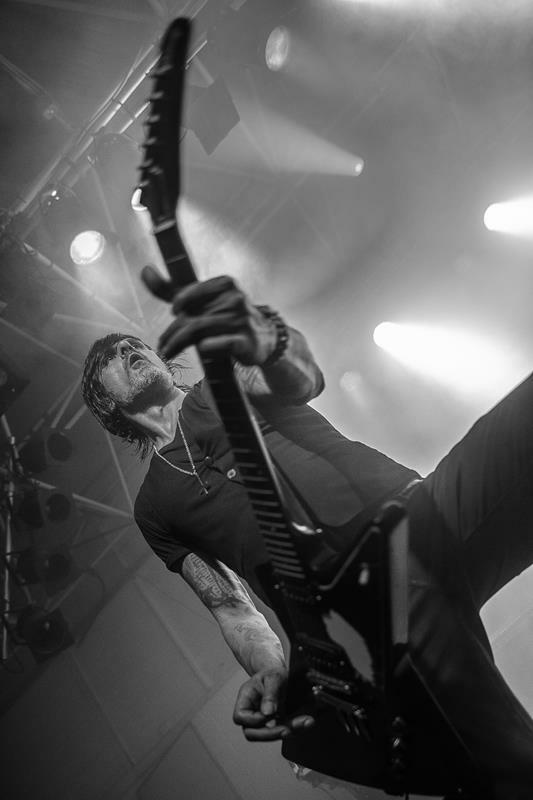 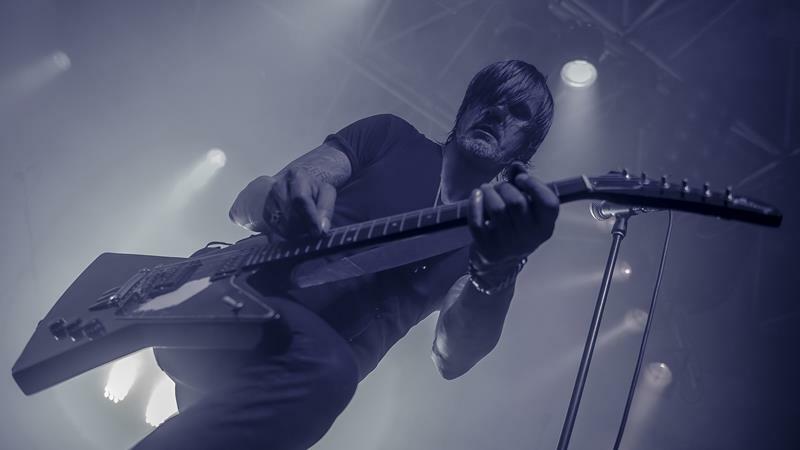 But also the guitar-heavy riffs of songs like ‘Crossfire’, ‘To the Hilt’, and - last song before the encore - ‘Fatherland’ catapulted the decade-old tracks into the here and now, and the audience embraced them with open arms. 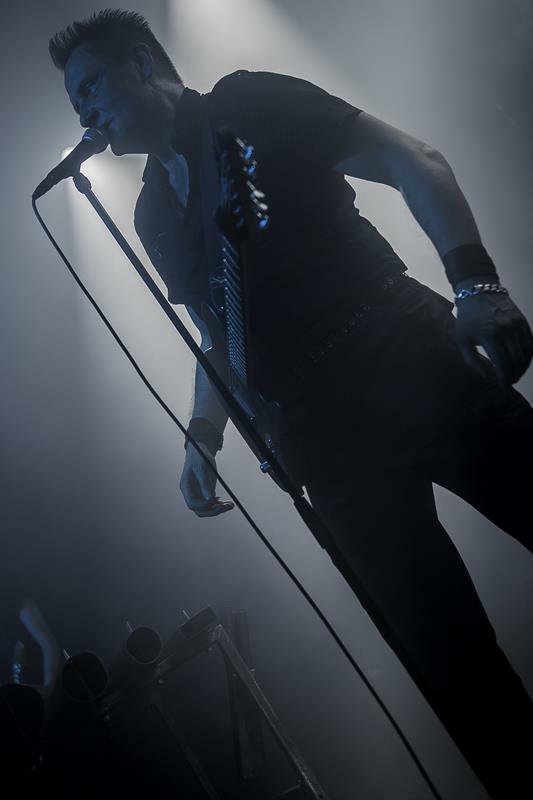 After an encore of two more songs and a good 90 minutes of playtime, the virtual curtain fell. 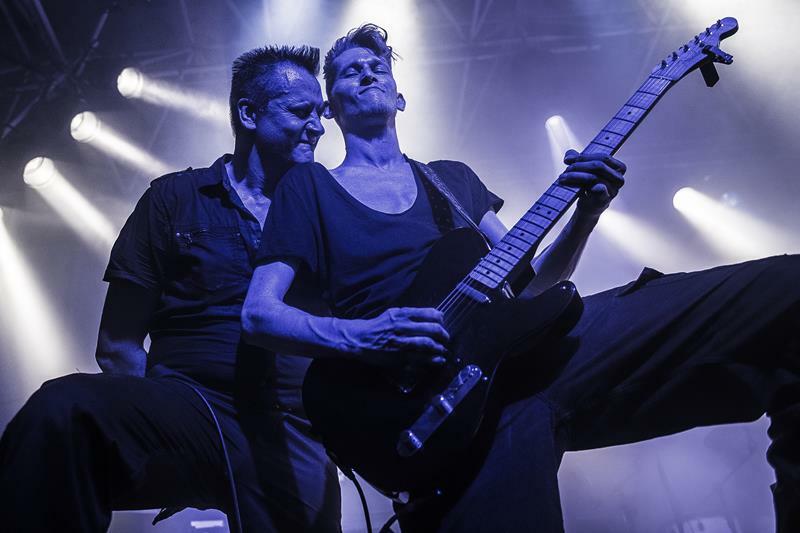 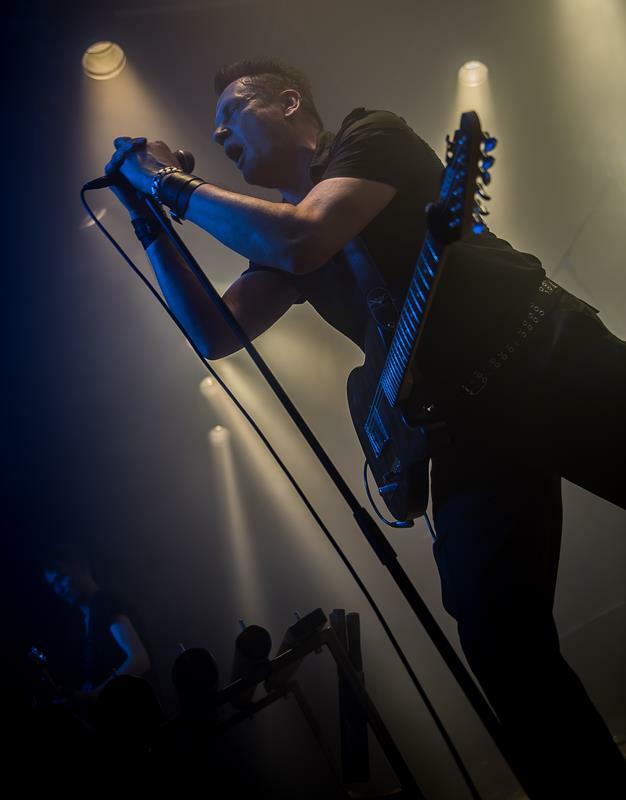 For fans of the band this concert definitely showed that DIE KRUPPS are still very much alive and kicking.